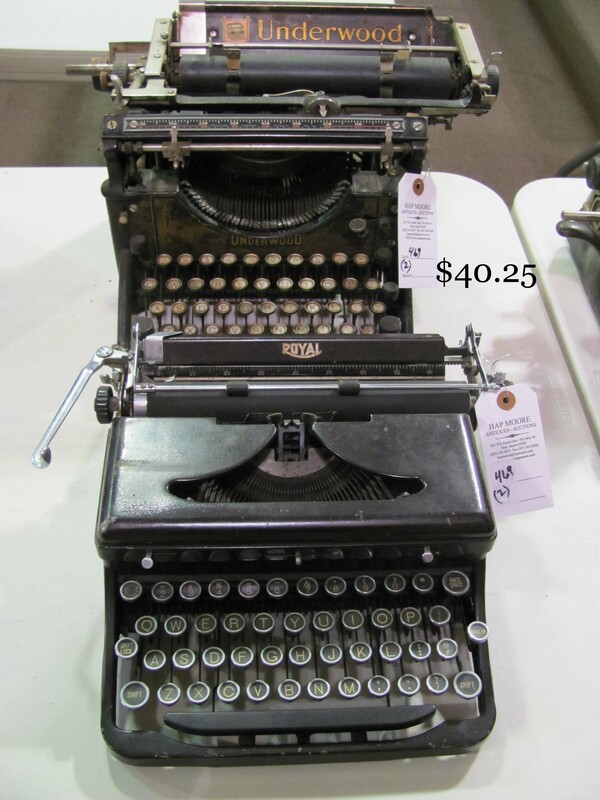 Saturday April 13, 2013 at 10:00 a.m.
Previews Friday, April 12th, from 2:00 to 6:00 P.M. 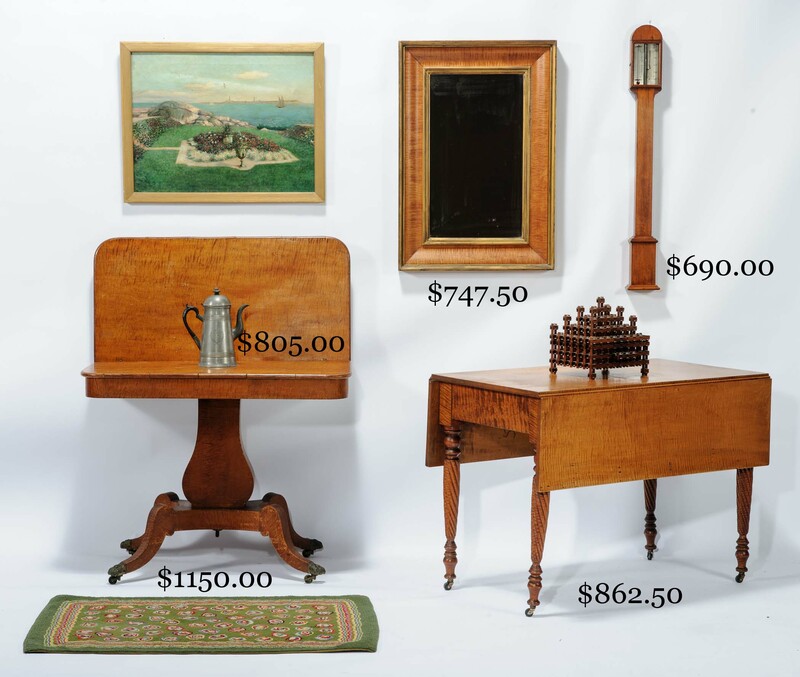 EARLY NEW HAMPSHIRE FURNITURE: Rare American Federal Period shaped top mahogany card table on reeded legs with flame satinwood veneer and banded pattern inlay, the table attributed to Portsmouth makers, Judkins & Senter, and recently removed from the family’s fifty year loan to The Old York Historical Society. 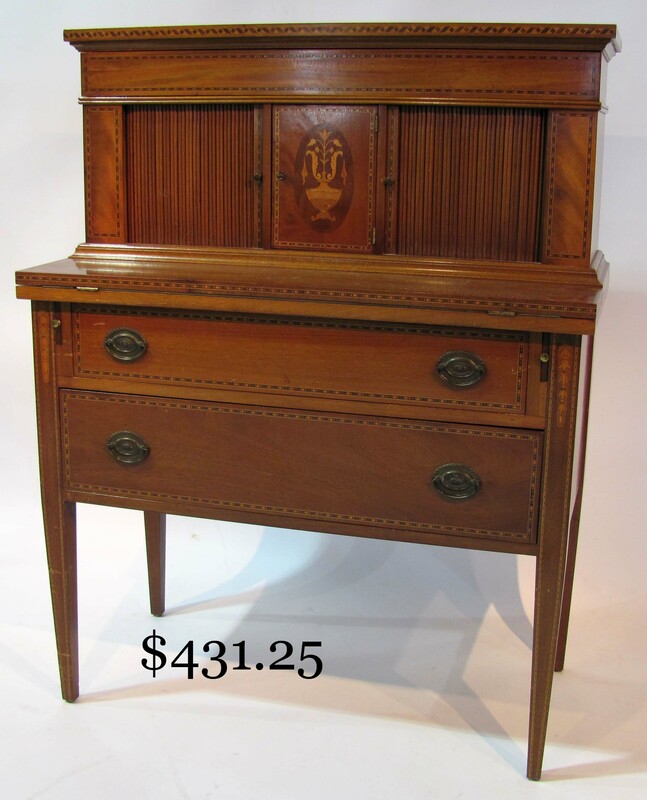 Shaped top Concord area Federal Period flame birch card table on fluted and reeded legs. Early 19th c. Portsmouth wing chair on turned post legs, attributed to Samuel Dockum and descending from Samuel Lancton Treat, Vaughan St., Portsmouth (1788-1862) directly to the present family member. Portsmouth area banister back armchair with double arch crestrail and side chair with fishtail crestrail. 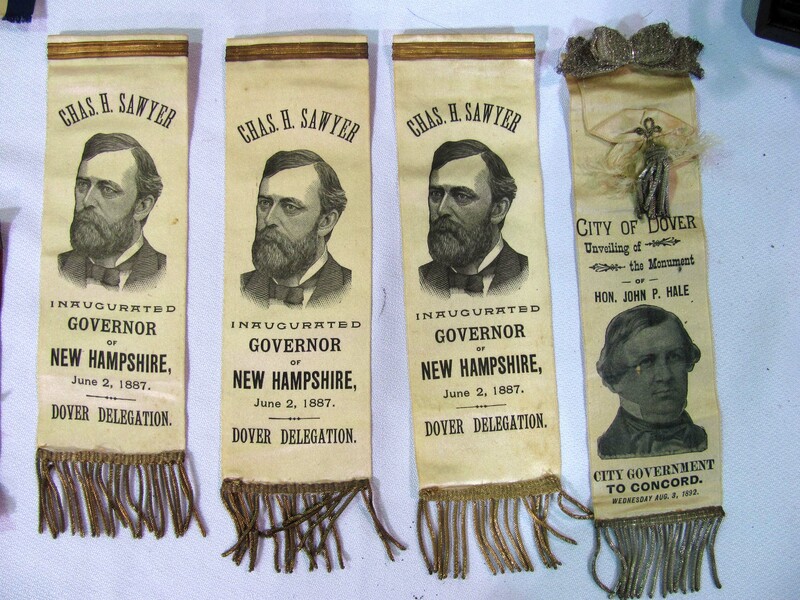 Rare Charles Wilder, Peterboro, NH stick barometer. OTHER EARLY FURNITURE: 17th c. spindle back birch or maple side chair in original worn surface with pine seat. 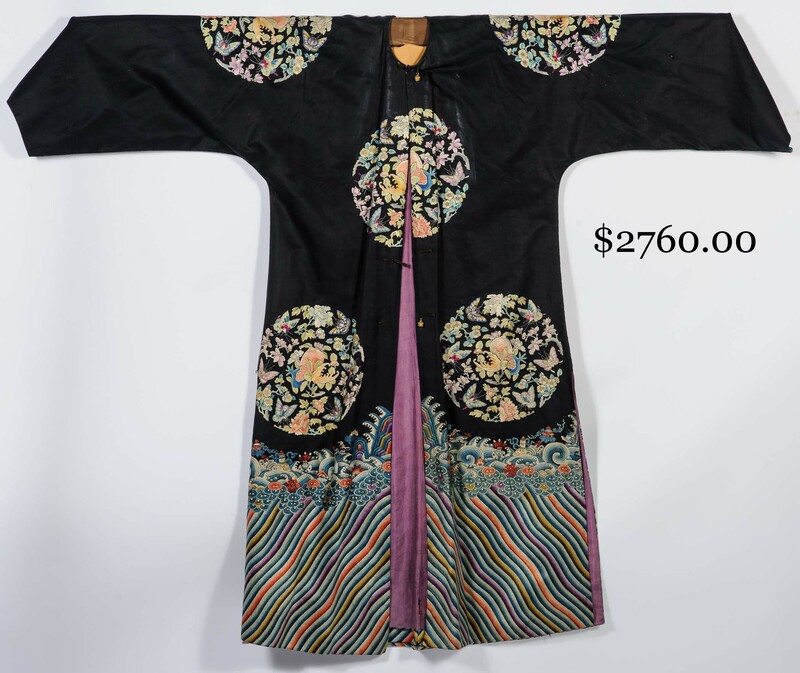 17th c. 74 X 33 in. English oak shoe-foot stepback garment cupboard over recessed seat. 17th c. Continental oak one drawer side table. 77 in. 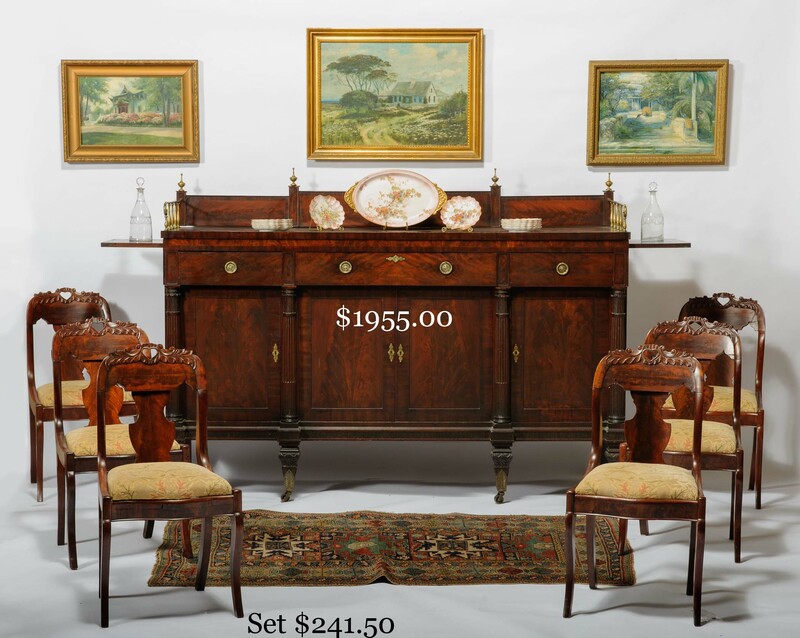 figured mahogany sideboard on reeded and leaf-carved columns and skirt, resting on carved tapering feet within cast brass leaf-form enclosures. 39 in. graduated four drawer bow front mahogany chest on French feet. 36 in. bow front mahogany graduated four drawer chest with paterae, floral and banded inlay. Mid-18th c. 38 in. graduated three drawer pine chest on shaped high base with center drop panel. 36 in. bracket-based birch Chippendale graduated four drawer chest. Mid-18th c. 41 in. mid-molded one drawer pine blanket chest on turned feet. 36 in. two drawer maple blanket chest with two false drawers. 46 in. early 19th c. one drawer pine blanket chest. 32 in. oval 18th c. pine-topped birch tea table on turned legs and button feet, originating in the Leavitt-Meserve Inn, Limerick, ME and descending through the Meserves to a family member. 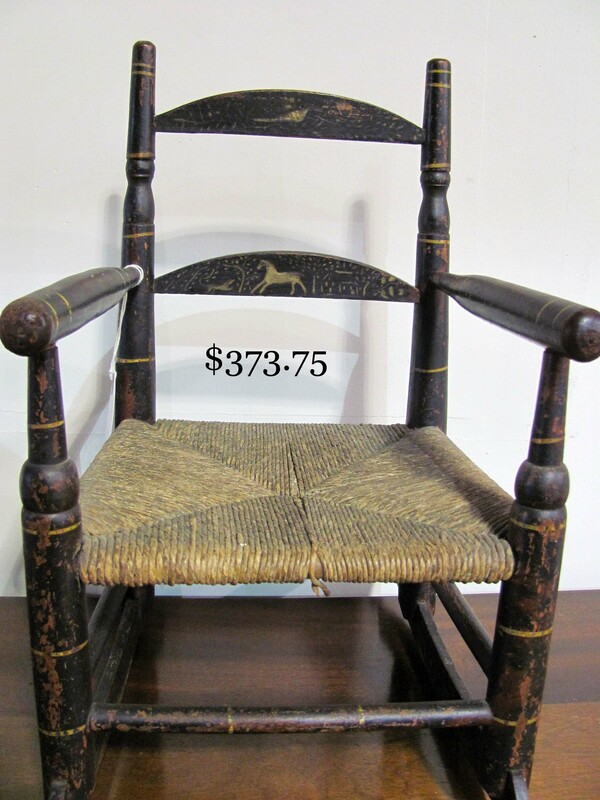 Sack-back Windsor armchair. 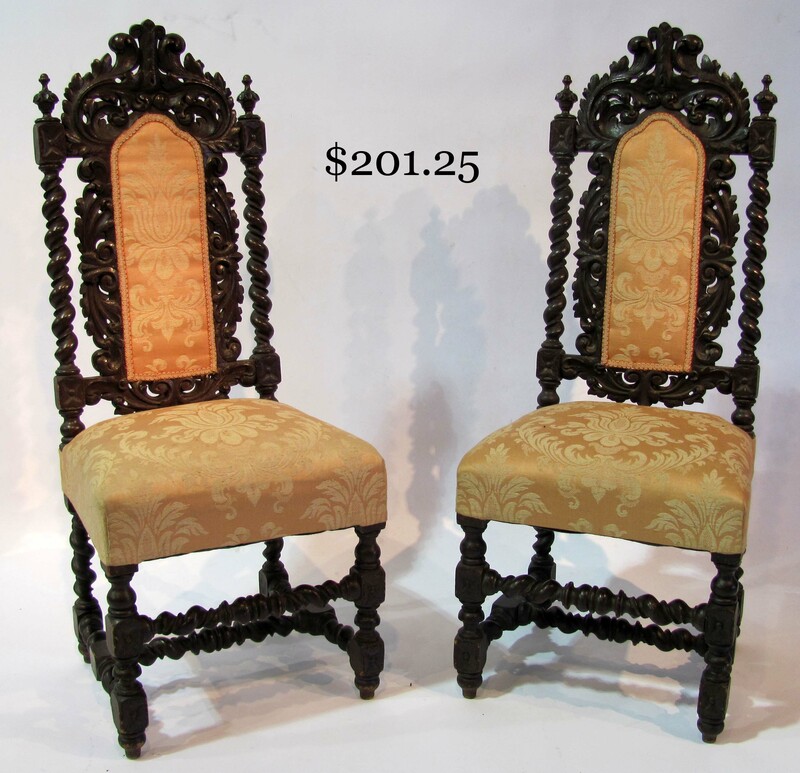 Pair heavily carved Flemish form Continental side chairs. 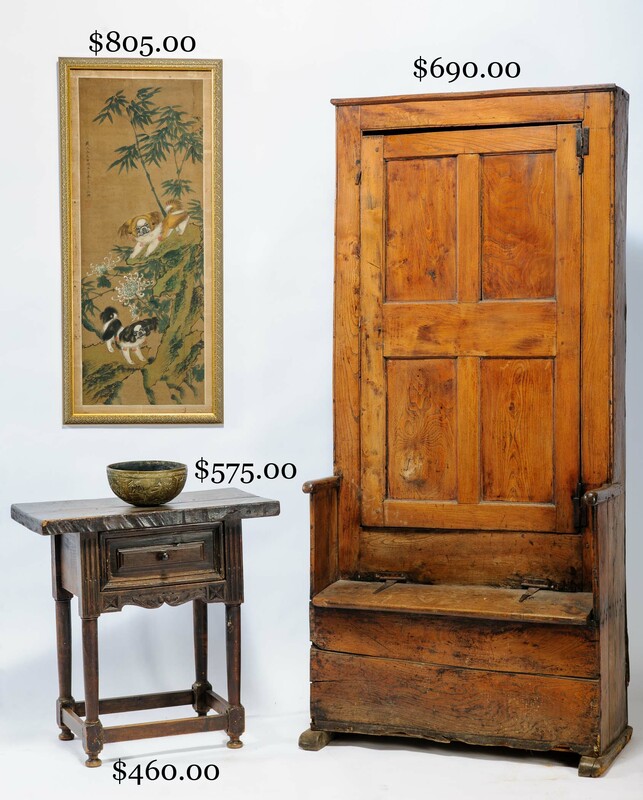 Early 19th c. splay-legged birch one drawer stand with medial shelf. Cookie-cornered mahogany two drawer stand on rope legs. 39 in. mahogany one drawer Pembroke table on reeded legs. Striking tiger maple Empire lyreback card table with brass talon feet. 41 in. tiger maple drop leaf table over a skirt and rope-turned legs of the rarest tiger and figured maple. Graduated three drawer stand on turned and carved legs with tiger maple drawer fronts. 33 X 24 in. mahogany three tier shelf with finely shaped ends. Fine N.E. one drawer red and black grain-painted stand. Enameled Chinese Export backgammon gaming table on pedestal base and carved giltwood feet. Full-sized 19th c. rope bed with deep-carved pineapple posts. Fine set of six Empire mahogany fiddleback side chairs with heart and leaf-carved crests. Two sets of five bird’s-eye maple fiddleback side chairs with caned seats. 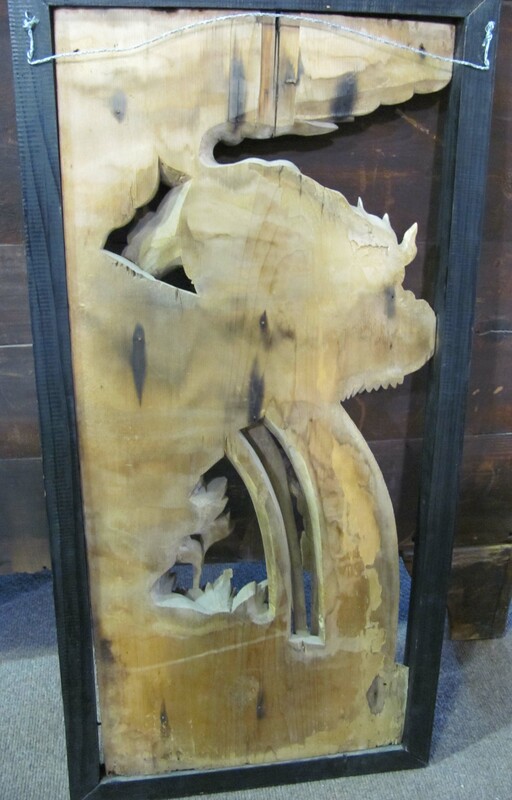 Split column Federal mirror with spread eagle crest and lion mask carved accents. Other Federal and tiger maple mirrors. 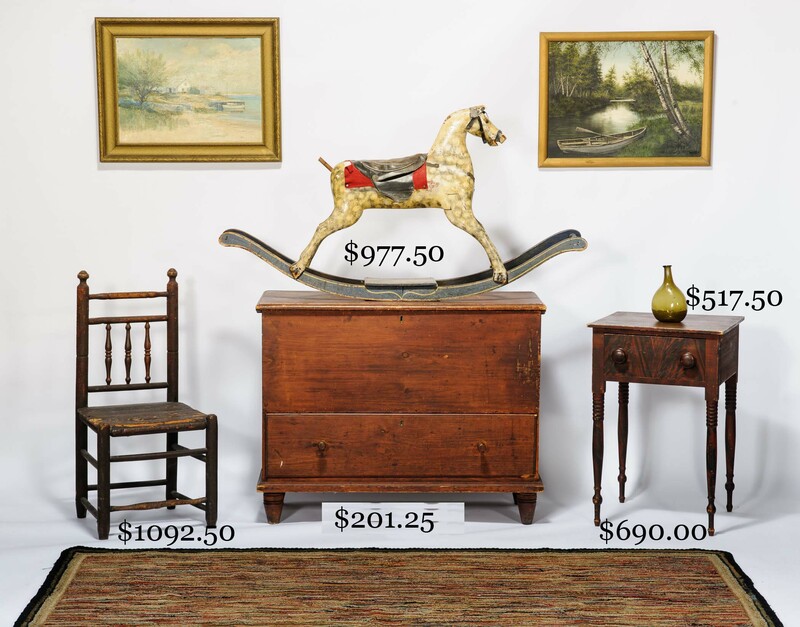 LATE 19th AND EARLY 20th C. FURNITURE: C. 1920 36 in. tambour desk with vase and bellflower inlay. Ithaca tall clock. C.1890 60 in. round pedestal-based mahogany dining table with seven 12 in. leaves. 54 in. tapered leg inlaid mahogany dining table with six 13 in. leaves. 66 X 40 in. mahogany dining table on double tripod pedestal base, the leaves expanding it to 101 in. 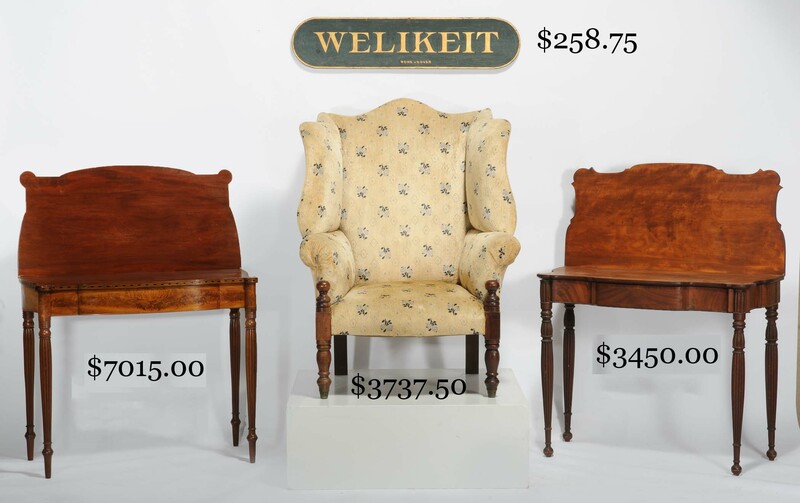 Set of seven late 19th c. lyre-back mahogany dining chairs on cabriole legs, including one armchair, the chairs having carved detail and leather seats. 48 in. 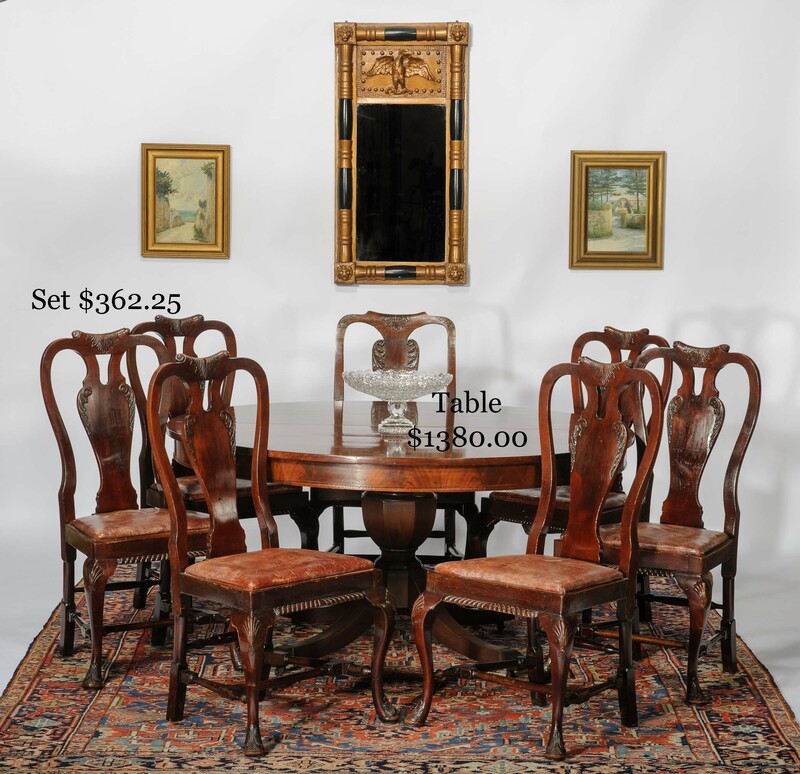 round oak pedestal-based dining table on pronounced large carved talon feet. 62 X 34 in. round glass oak china cabinet. 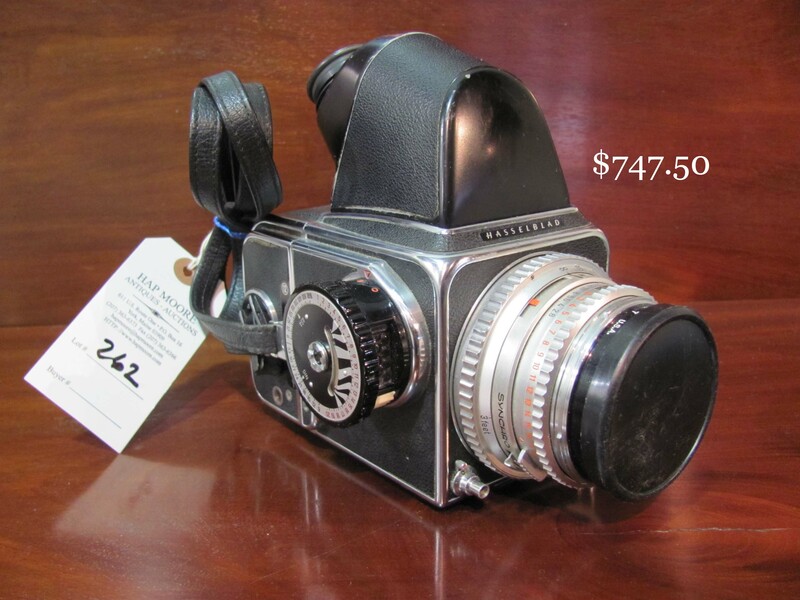 Distinctive 61 in. one drawer shaving stand on rope-turned tripod base. Rare form Victorian 59 X 64 X 15 in. 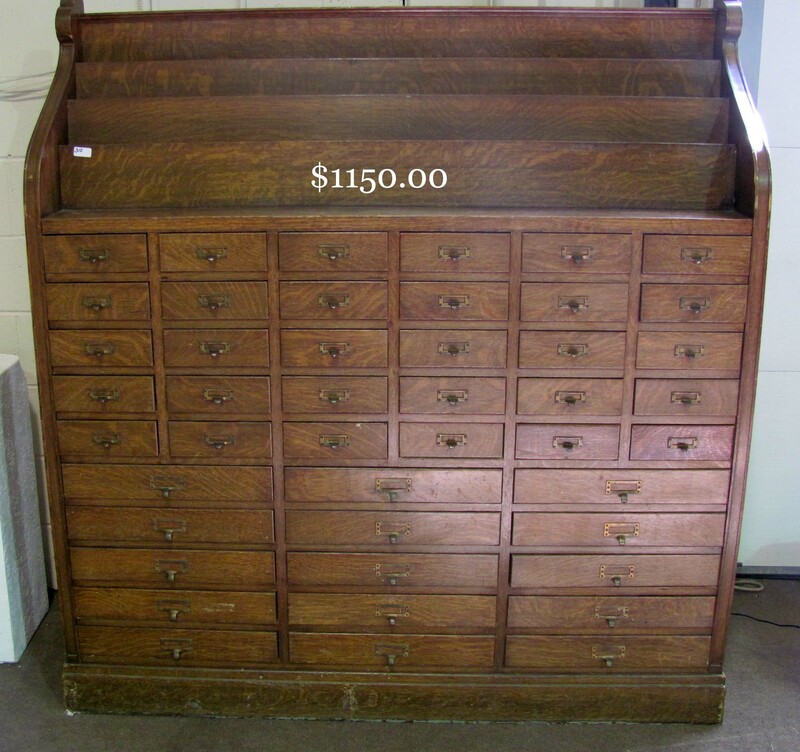 45 drawer storage/display case. 61 X 24 in. oak case of eleven storage drawers. 26 X 17 X 9 in. mahogany case of practitioner’s instrument drawers. “Whetstone’s” store display case. 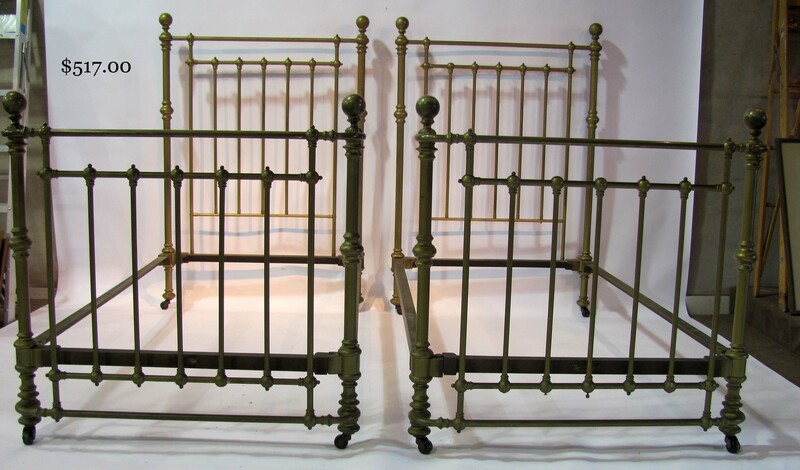 Pair of better Victorian brass twin beds. Oak and leaded glass mahogany barrister bookcases. Marble top sewing and side tables. Interesting earlier and later occasional furniture. 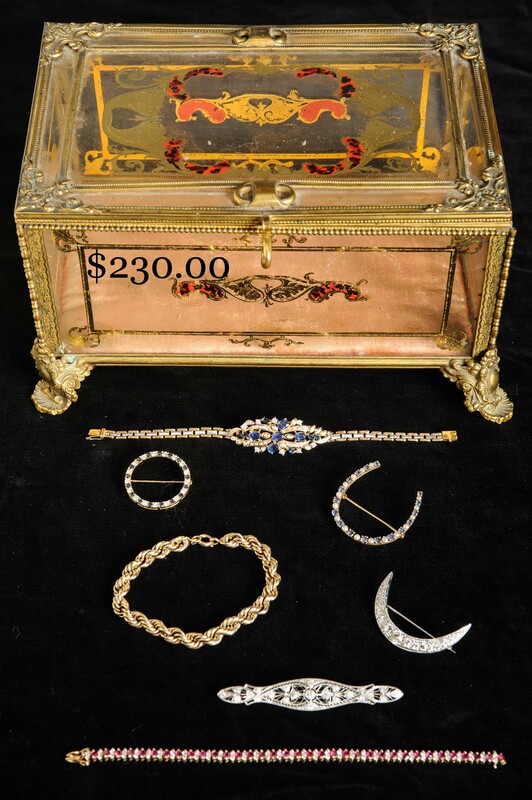 ESTATE JEWELRY: Good and varied selection of gold, sterling, platinum and gemstone jewelry and pocket watches. Fancy decorated and gilt metal 9 X 6 in. 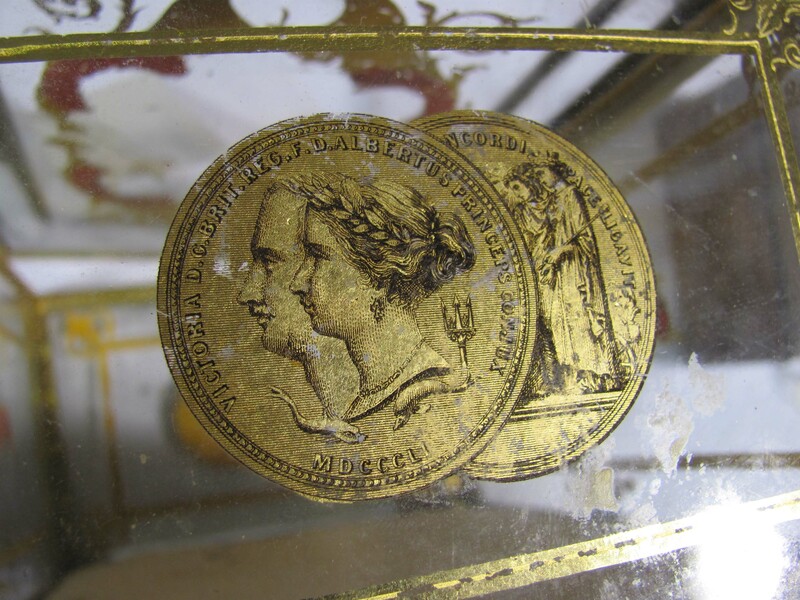 jewelry box with images of Napoleon and Queen Victoria. 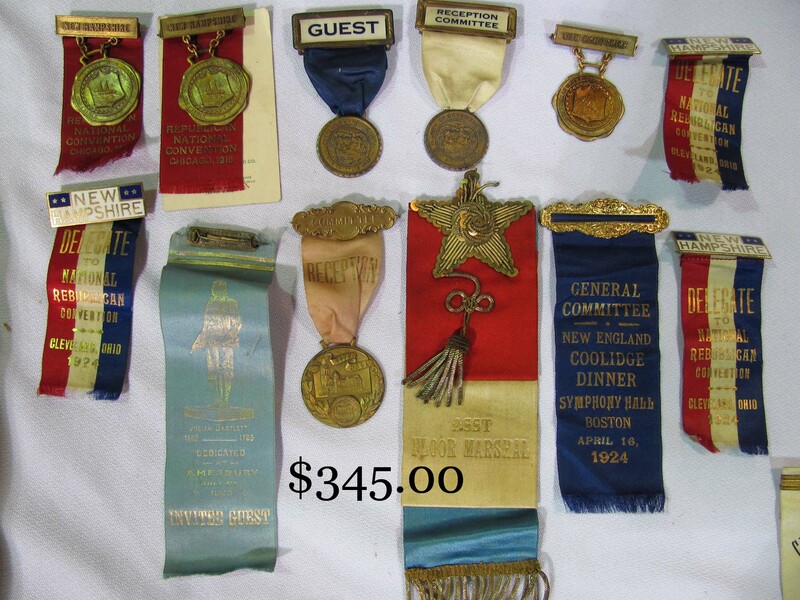 Victorian and 20th c. costume jewelry. ESTATE CHINA, POTTERY AND GLASSWARE: 7 in. 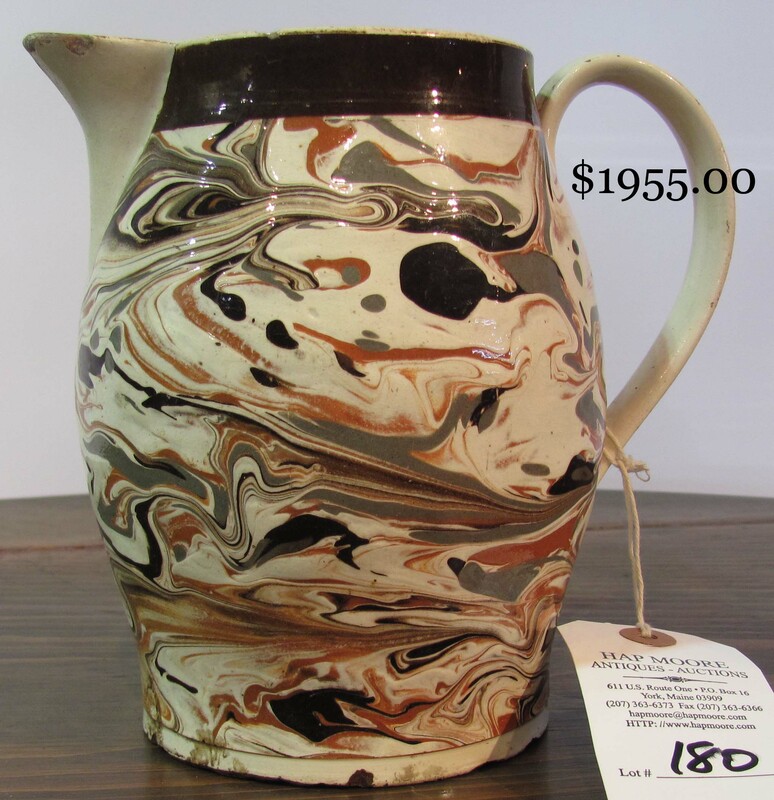 marbleized Mocha pitcher. Soft paste, including 9 in. openwork basket and peacock three piece tea set. Good Parian Empire style teapot. Ridgway 18 in. Theatre Printing House, Oxford platter. Tyrolean blue and other transferware. Jeddo Mulberry. Fancy Doulton, Burslem dessert set. 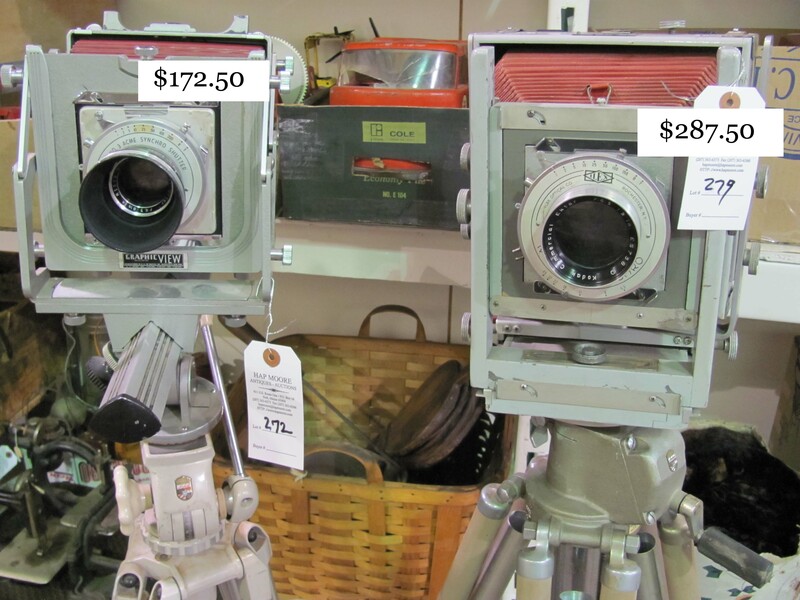 Large selection of Canton ware. Large set Trade Winds Blue dinnerware, including serving pieces. 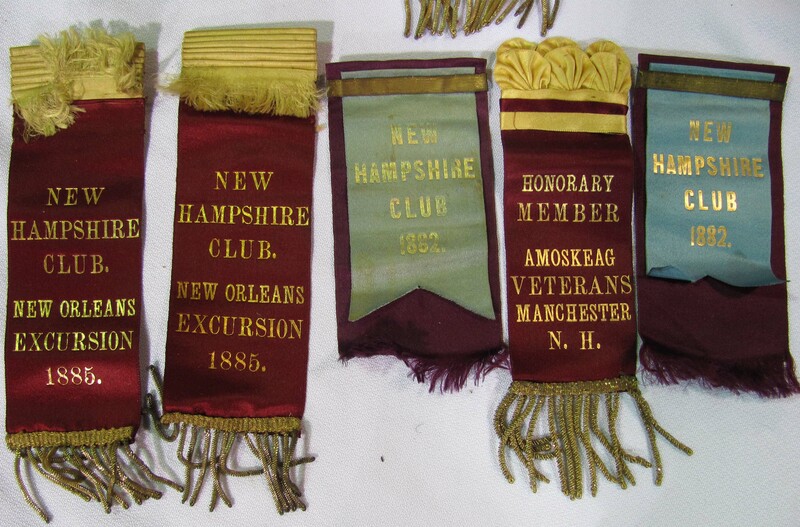 Sets of Harvard and Exeter plates. Nippon stag-decorated smoking set and chocolate set. Early Whieldon. Corn Majolica. J. Wedgwood patterned white ironstone soup tureen with ladle. Rockingham game and floral pitchers. 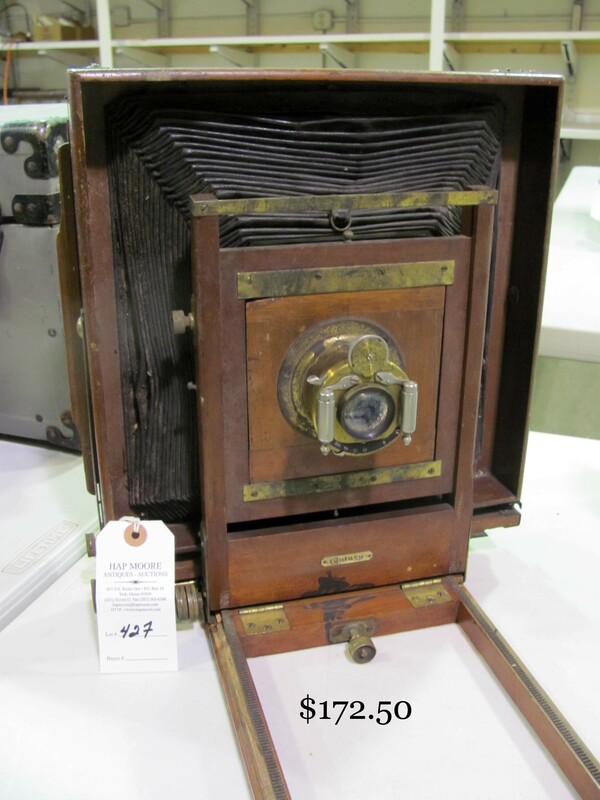 Lamson & Swasey 1882 blue-decorated 3 gal. stoneware jug. Pr. blue Rookwood rook bookends, Footed Fulper vase with 10 in. flared opening. Good Roseville and Weller vases. 8 in. chestnut and tall gin bottles. Early etched decanters. Old whale oils. Sandwich. Blown 7 in. pitcher with applied handle. Large single owner collection of Heisey glassware, separated in reasonable lots. 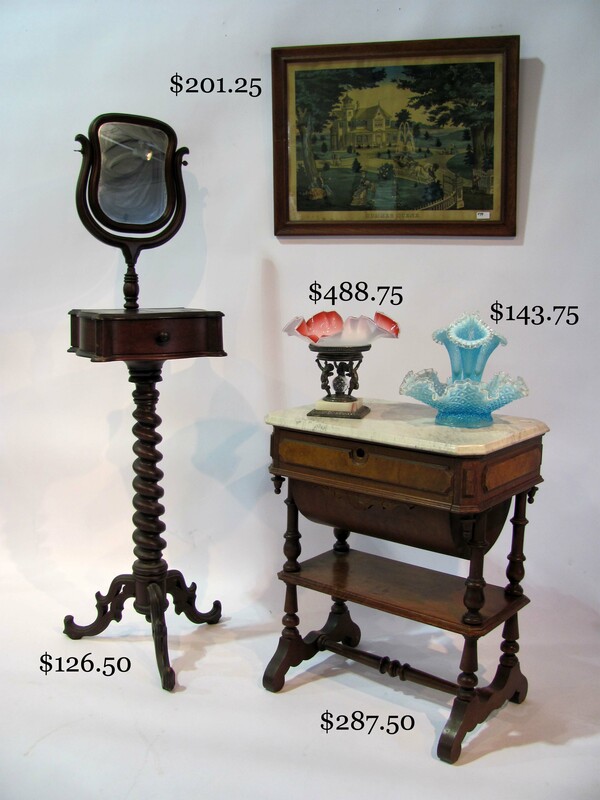 Good Victorian colored glass, including large blue to white three font epergne, Pairpoint putti-mounted center basket and 14 in. blue coinspot water set. Striped cranberry barber bottle. Sterling overlay cranberry cologne. 16 in. Bohemian covered vasiform jar. Stately 14 in. footed crystal compote. Indian SAGW and other old bottles. 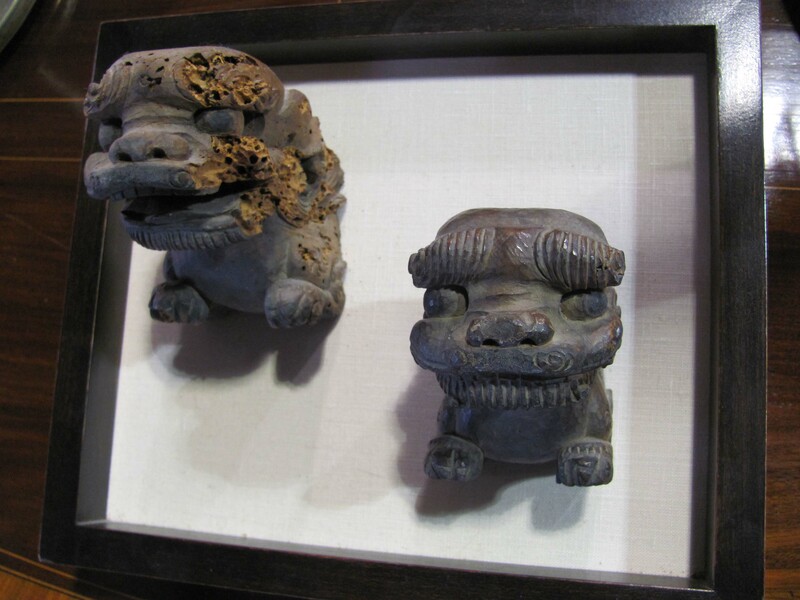 Large collection of figural ceramic and other salts and peppers and collection of old ceramic dogs and animals. FOLK ART: 29 in. 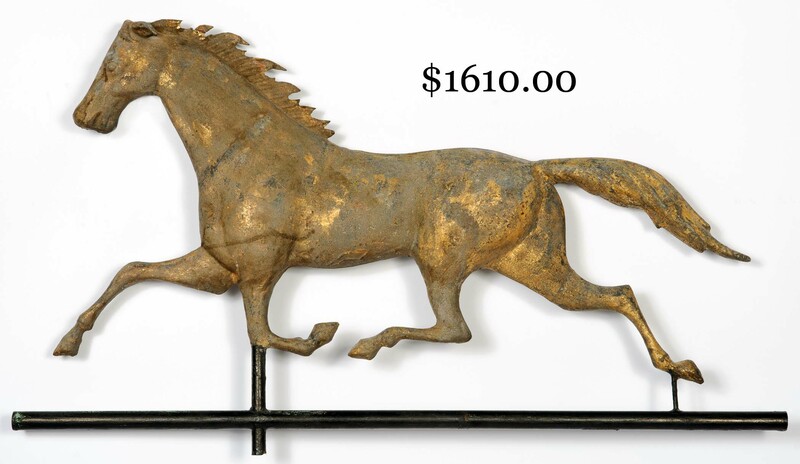 hollow copper running horse weathervane. Child’s carved and decorated dapple rocking horse. 32 in. 20th c. W. Ketzler, Eliot, ME ornamental carved eagle with banner. 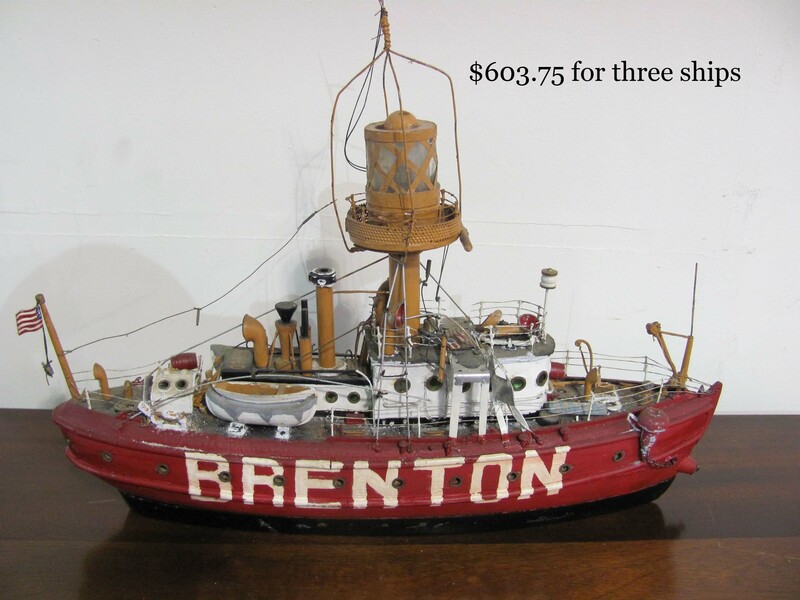 Vintage models of the lightships Boston, Vineyard and Brenton. 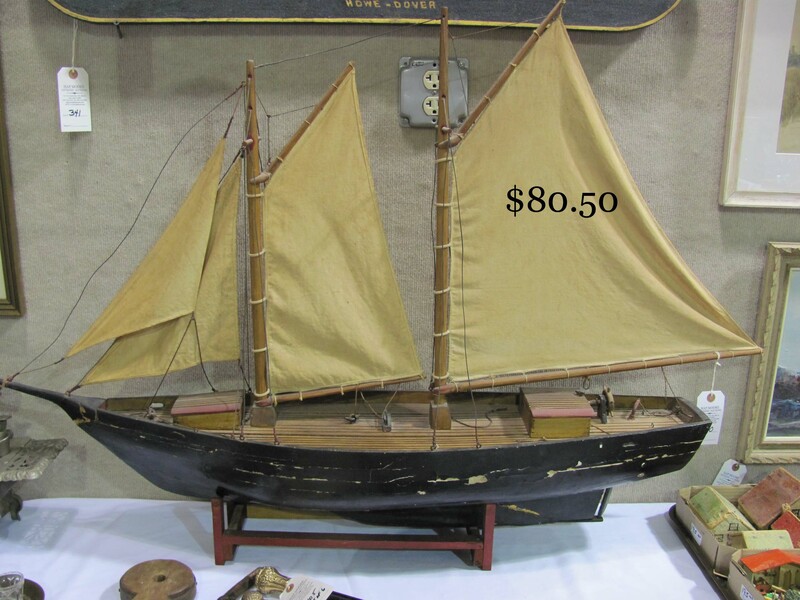 C. 1900 fully rigged 42 in. 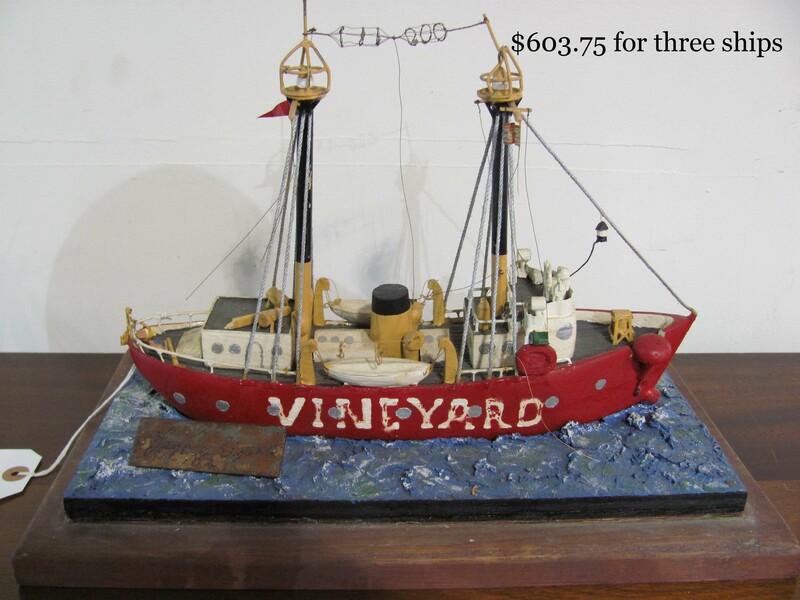 sailboat model. 15 X 20 in. 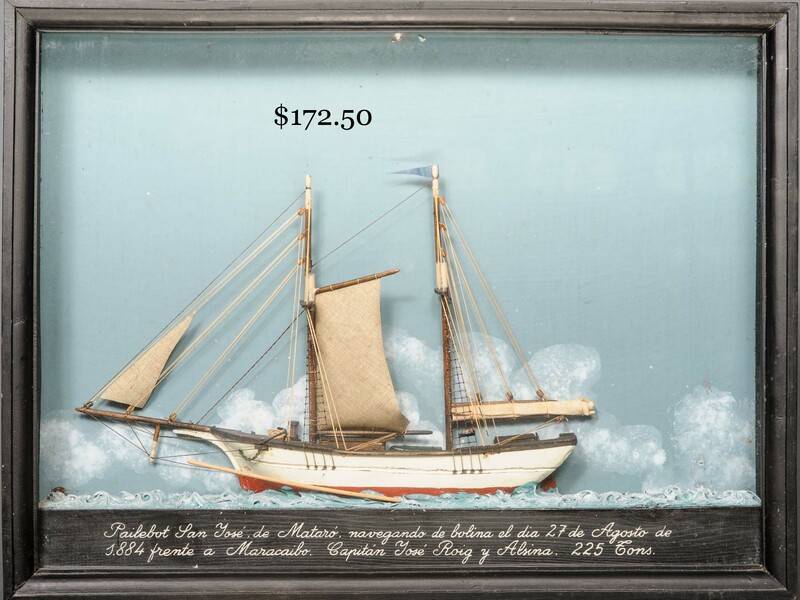 diorama of the ship San Jose de Mataro near Maracaibo in 1884. 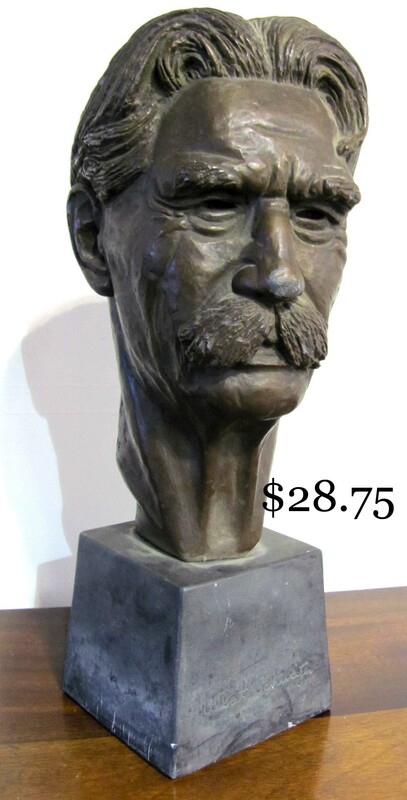 Sculpted plaster bust and folded hands by early 20th c. sculptor, David Bartlett. Openwork carved tramp art box. OLD DOLLS: Good selection of various size bisque head dolls, clothing and accessories. Black dolls. Doll furniture and dishes, some in orig. 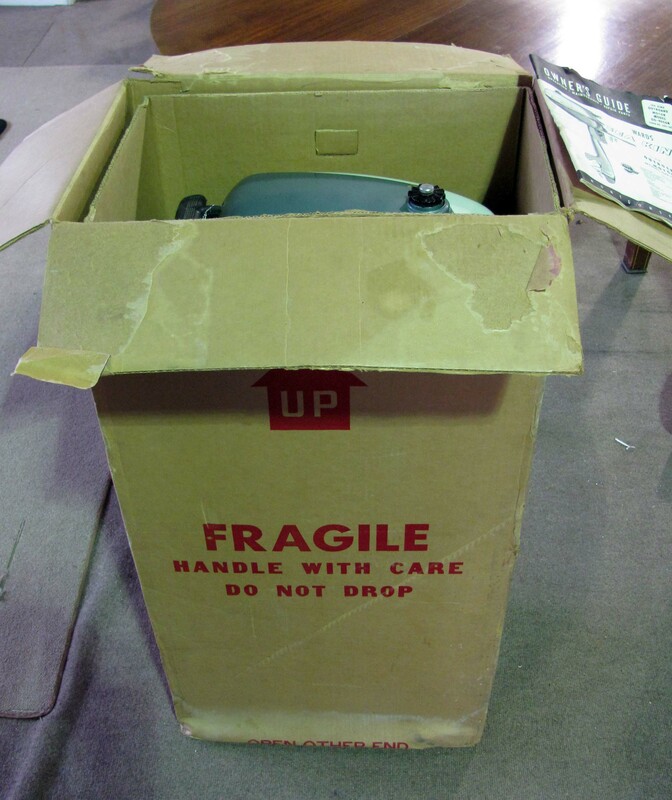 boxes. Early and well-loved 14 in. Steiff teddy. Later Steiff animals. 15 in. Skookum doll. Kewpie, Nisbet and good 50’s vinyl dolls. Good selection of 20th c. dolls in original boxes. Unusual wicker and wire doll carriages. Horse decorated 19th c. doll chair. OLD TOYS: Good tin windups, incl. 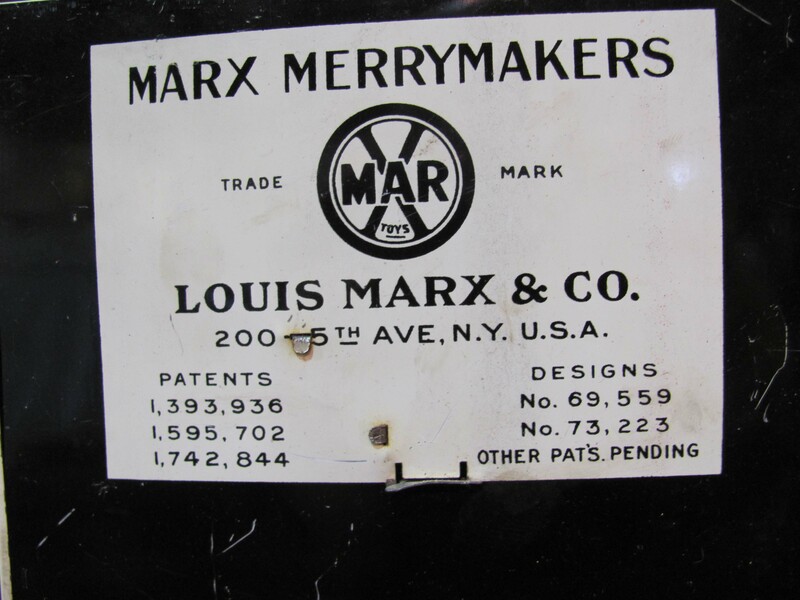 near mint Marx Merrymakers (back detail), Busy Lizzie, Lindstrom Betty. 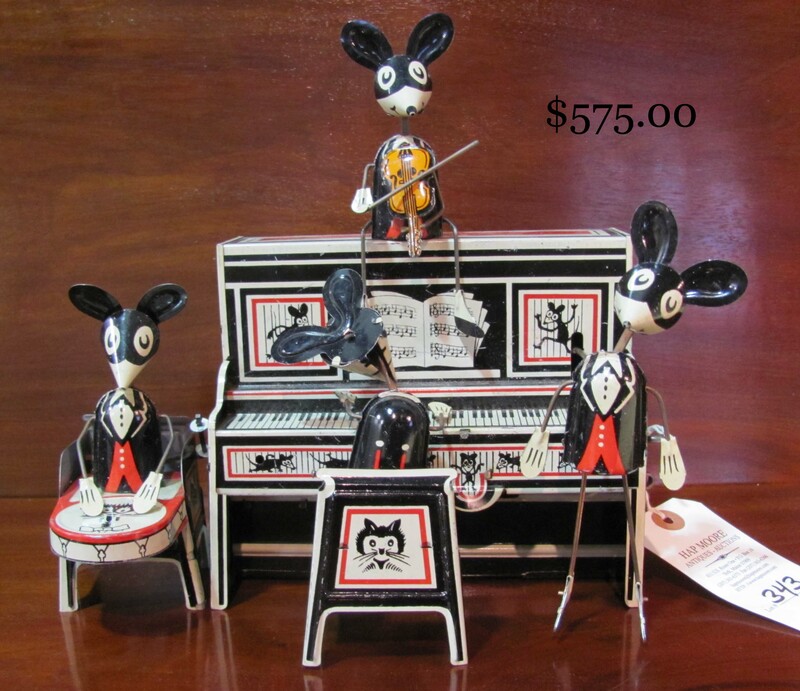 Disney Seiberling Mickey and detached Felix. Large single owner collection of W. Britains in original boxes. Dinky Toys’ Mechanised Army and Medium Tank Set. Sel. 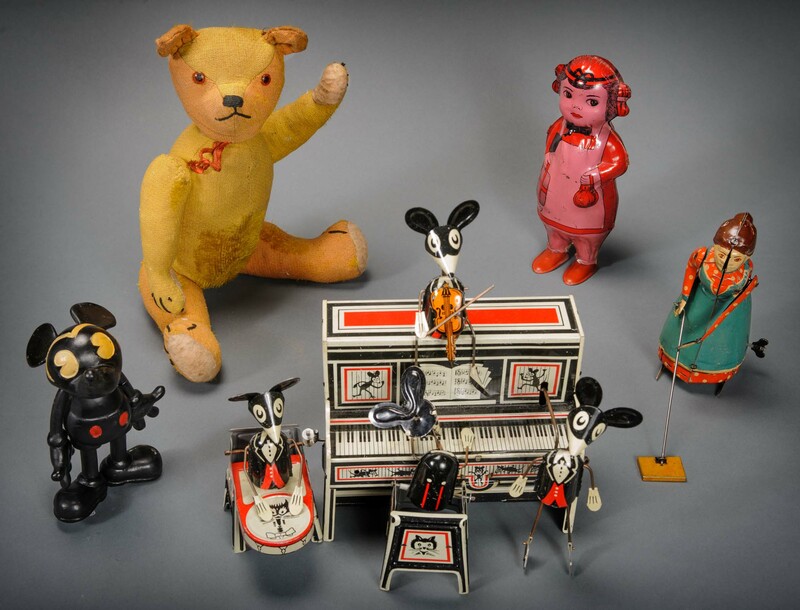 of 20th c. windup toys, many in original boxes. Cast iron Eagle cook stove and unusual child’s tin stove with cookware. 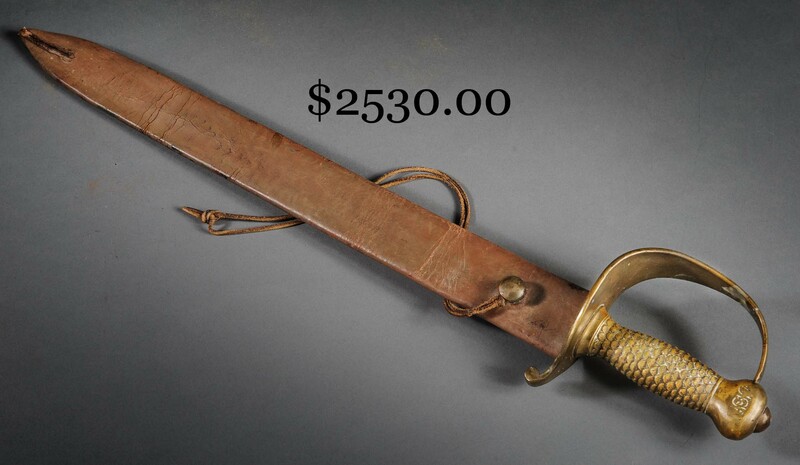 MILITARY: CSN marked Confederate Naval sword, 26 ½ in. overall, in original scabbard. L.G. & Y., Windsor, VT 1863 musket with bayonet. Early and fancy kris knife. Early spurs. 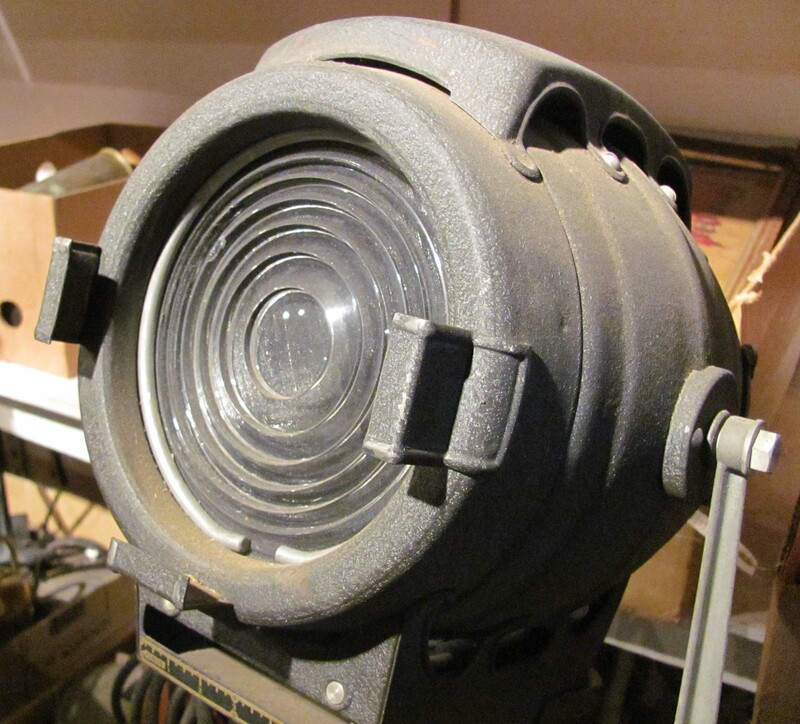 OLD LIGHTING: Signed Oscar B. Bach 27 in. 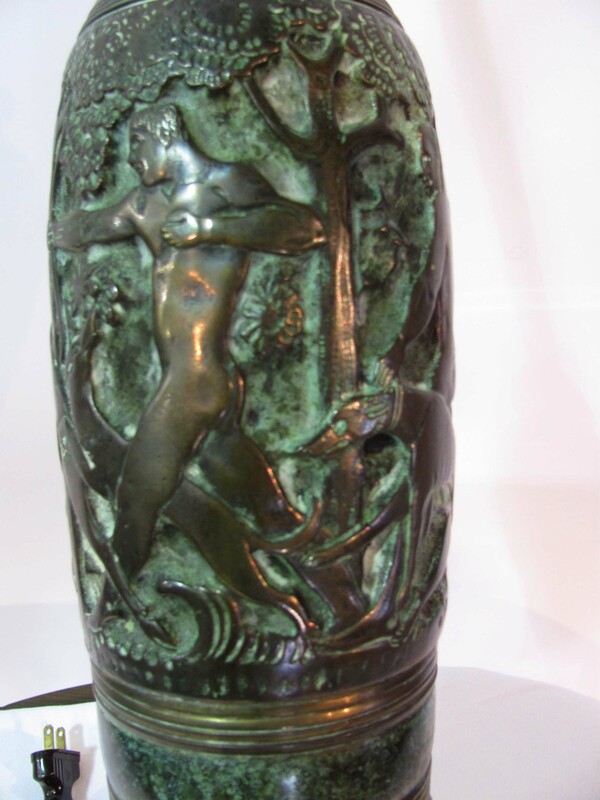 bronze table lamp, depicting archers and hounds on a hunt (finial). 9 ½ in. 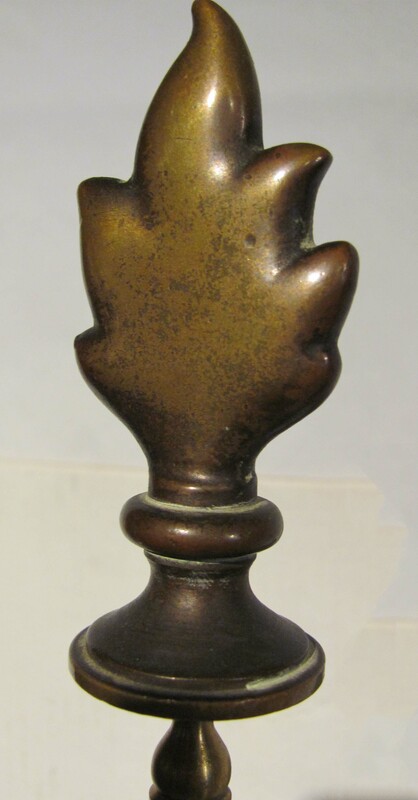 Japanese bronze candlestick with serpent and dragons. Pewter and glass whale oils. Hanging exterior and interior lamps. 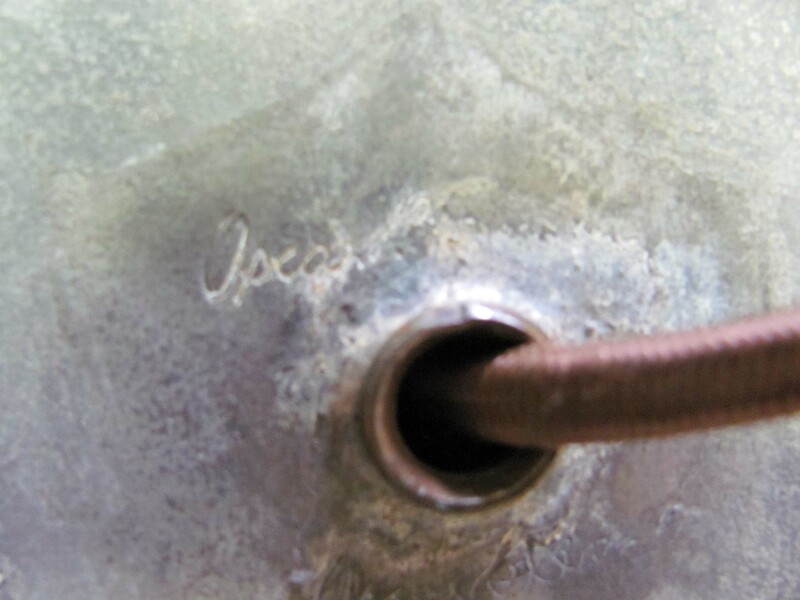 Good skater’s and other hand lamps. ARCHITECTURAL AND GARDEN: Vintage 31 X 22 in. 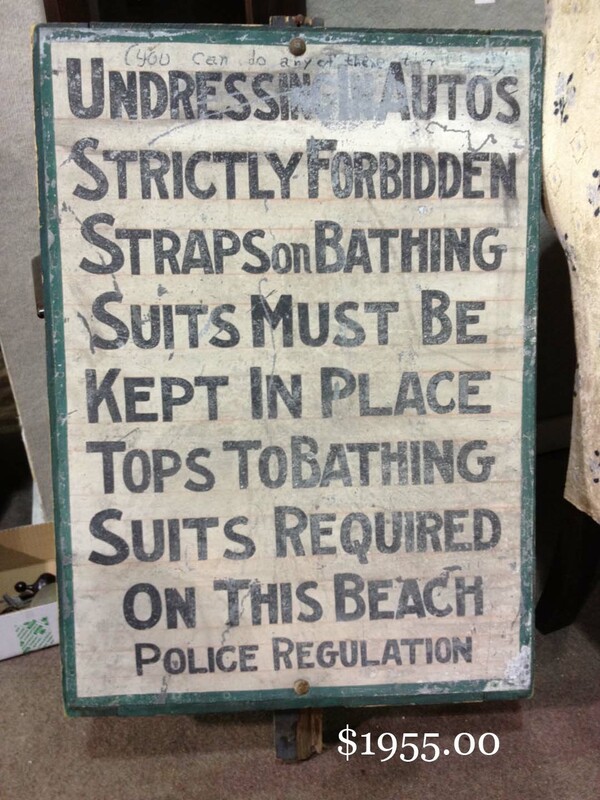 York Beach bathing suit advisory sign. Old 39 in. WELIKEIT camp sign. 50 in. 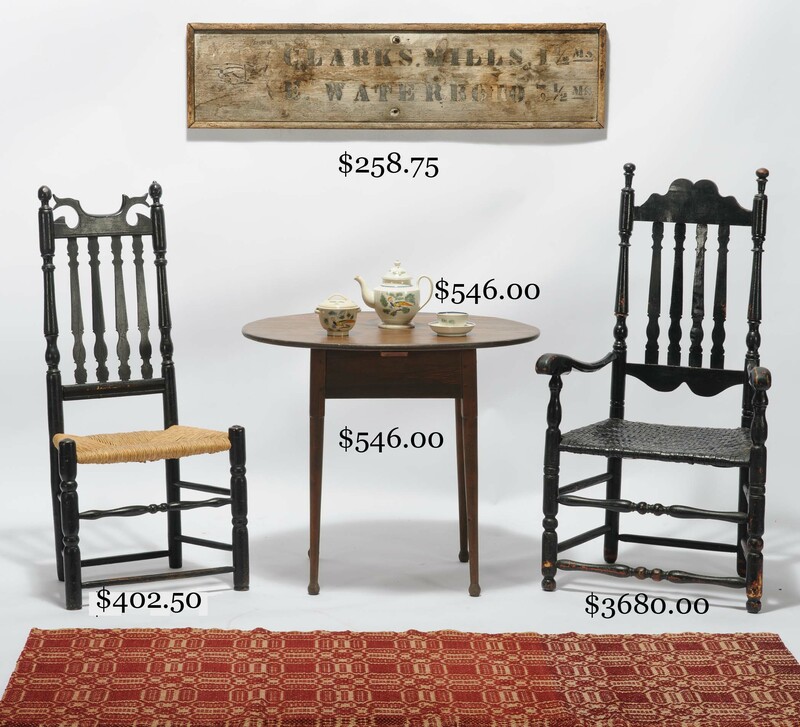 1907 Clarks Mills/E. 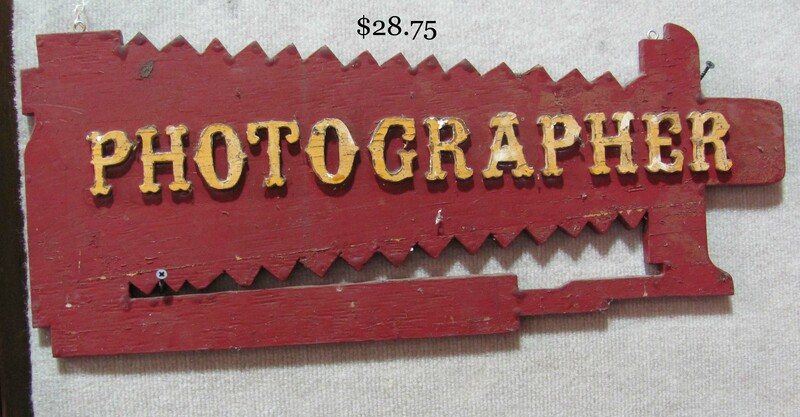 Waterboro (ME) wooden road sign. 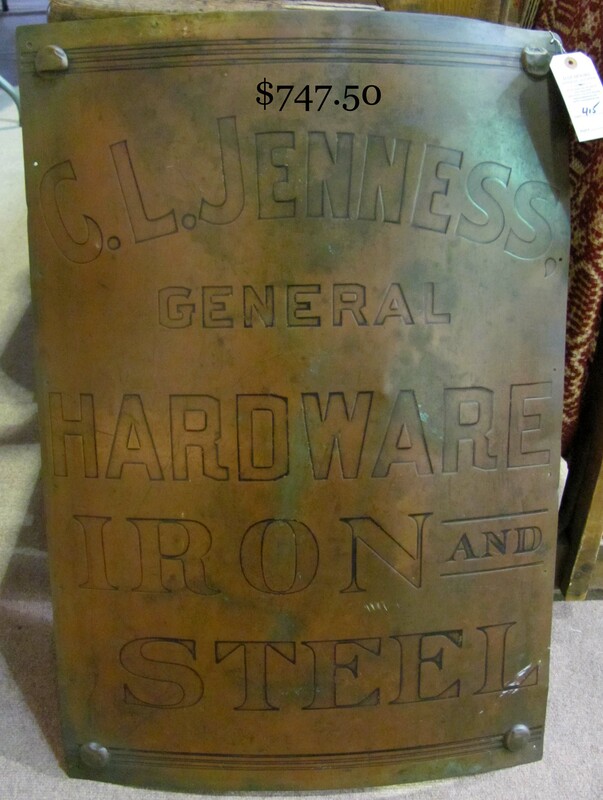 Early 20th c. brass C. L. Jenness Hardware (Dover, NH) sign. Very fancy 37 in. wrought iron plant stand. 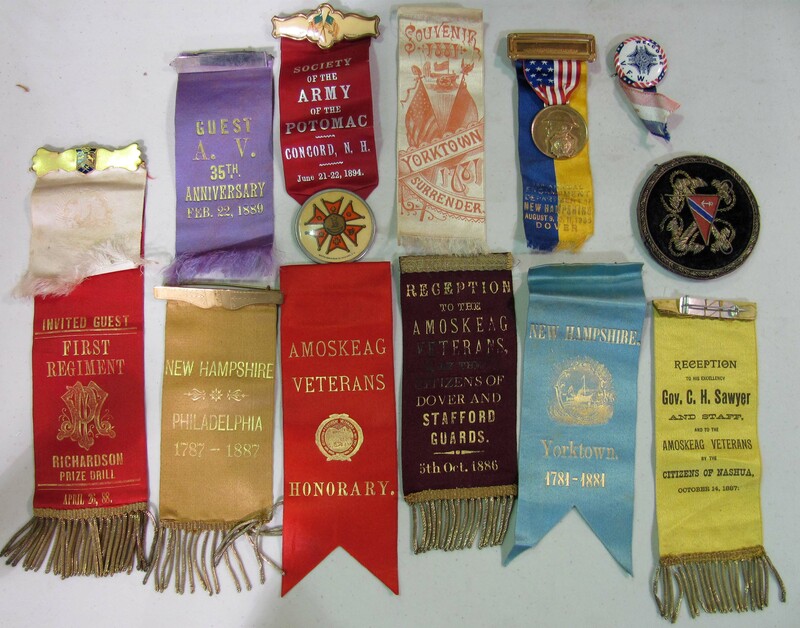 OLD BUTTONS: Graphic quilts, good linens and household textiles. 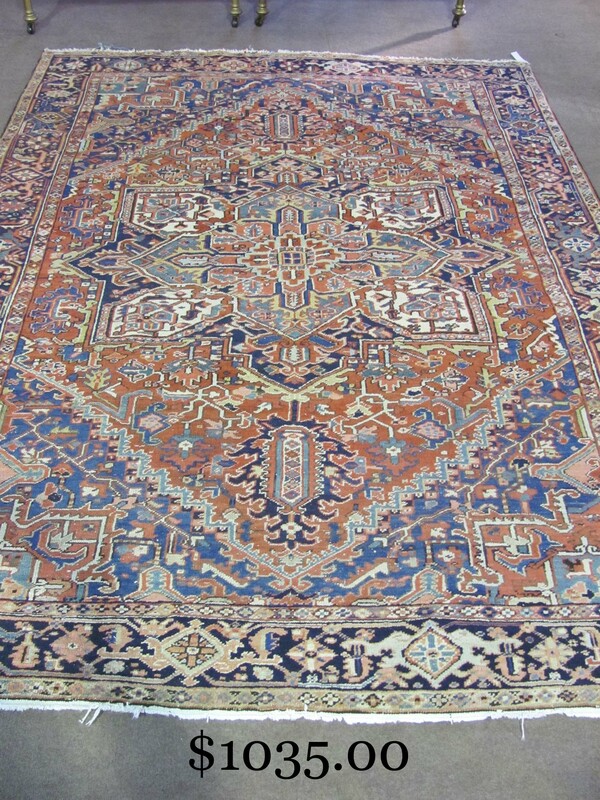 ESTATE RUGS: 10’6 X 7’9 Heriz. 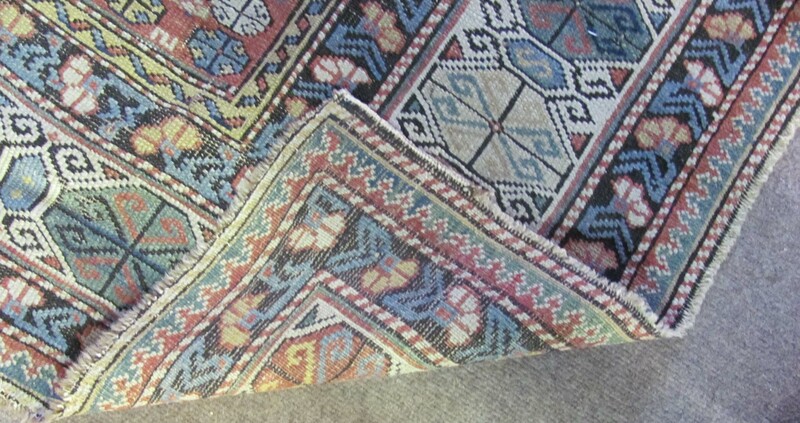 5’9 X 3’9 Caucasian scatter rug (detail). 7’6 X 6’7 in. geometric pattern hooked rug made by Georgia Meserve (1860-1949) of Buxton, ME. 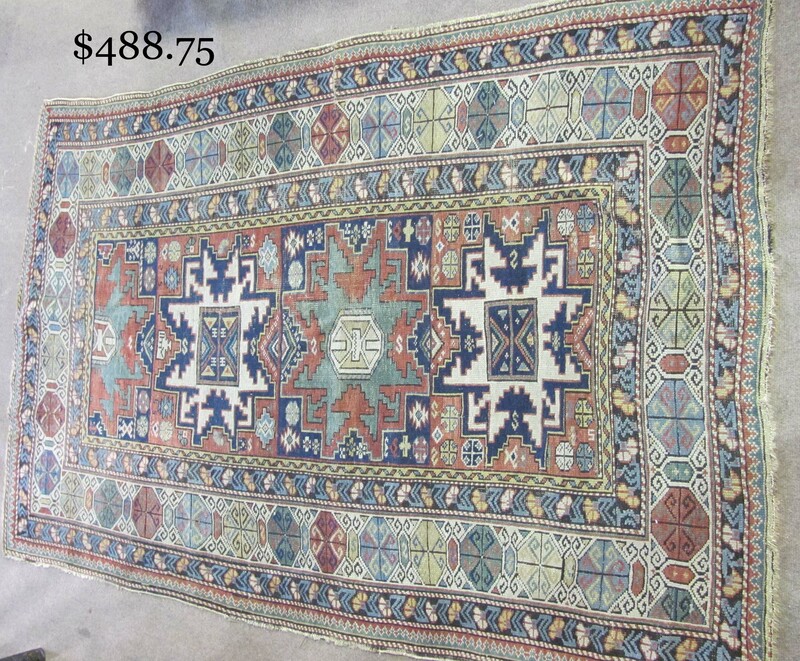 Colorful collection of twenty mid-20th c. bound and unbound hooked rugs, including geometric, floral, landscape, human and animal motif, all made by Esther Mae Forrest, Durham, NH. 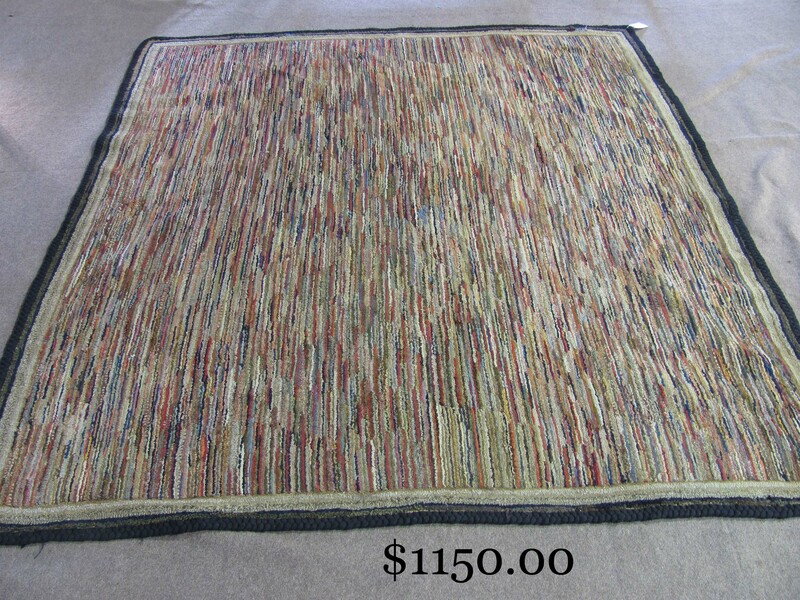 Selection of Ms. Forrest's braided rugs. 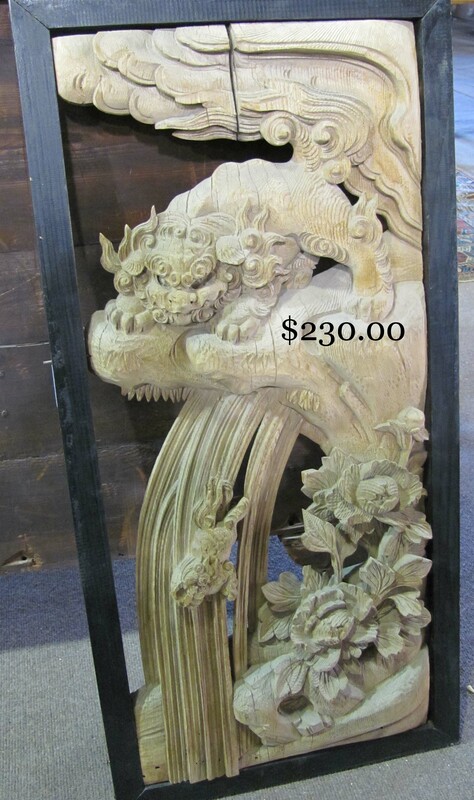 ASIAN OBJECTSAND WORKS OF ART: Graphic genre-carved 30 X 8 in. giltwood framed panel thought by family to originate from the Thai shrine at Ayutthaya. 40 x 15 in. watercolor on silk of foo dogs playing (sign). Framed 30 X 13 in. Japanese carved panel depicting foo lion and cub in a waterfall (detail 1, 2). 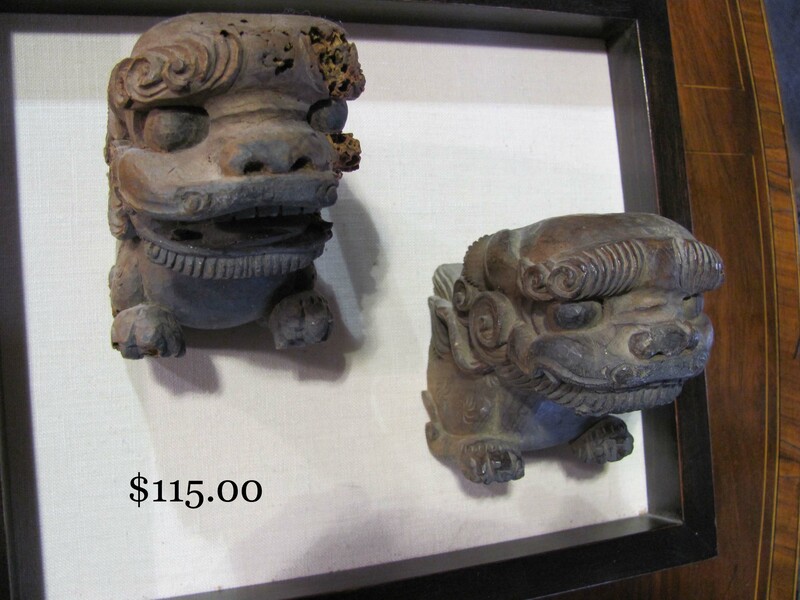 Pair of 18th c. carved and mounted Chinese foo dog heads (1). Famille verte and Famille Rose vases. 9 ½ in. 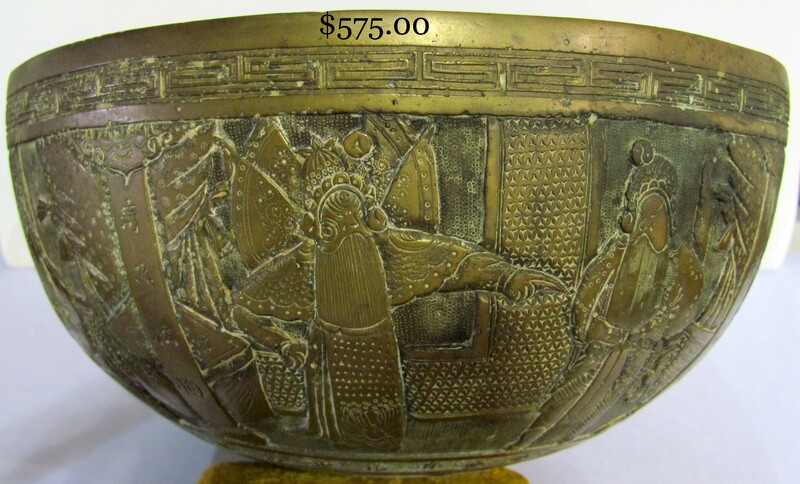 Signed bronze bowl (1, old repair) with genre panels 15 x 40 in. Small bronze bowl on frog-form legs. Antique carved ivory pillbox. Triptych of three 4 x 5 in. 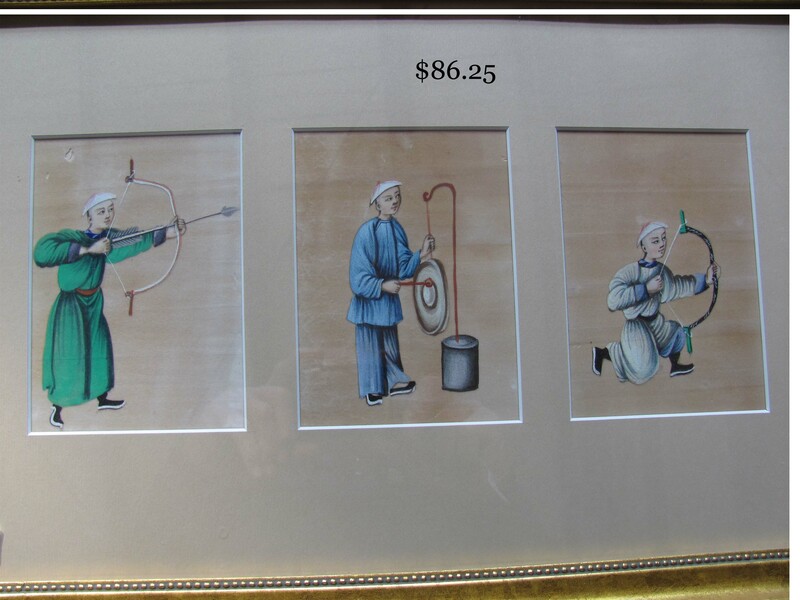 watercolors of archers. 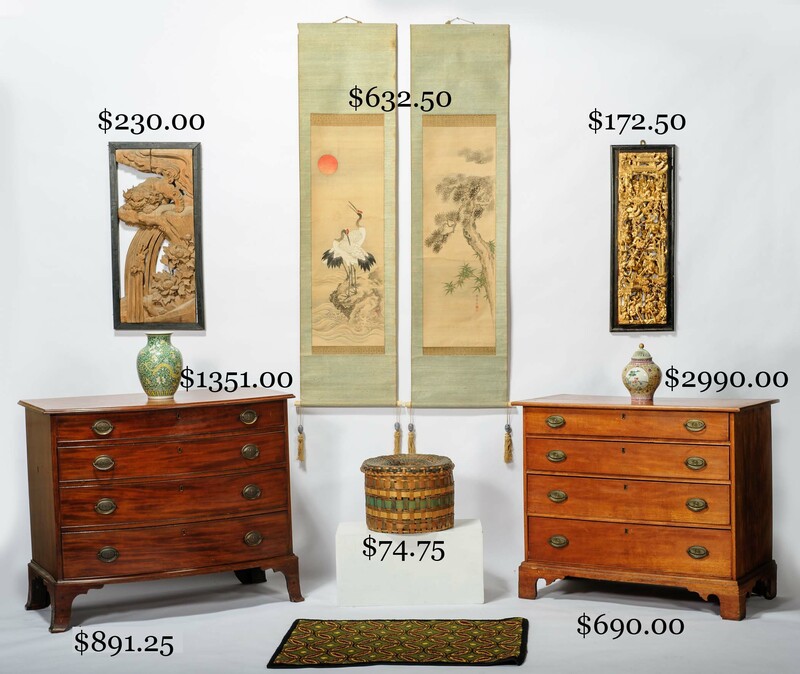 Pair boxed signed Japanese scrolls. Three Chikanobu triptychs (1, 2, 3). MISC. 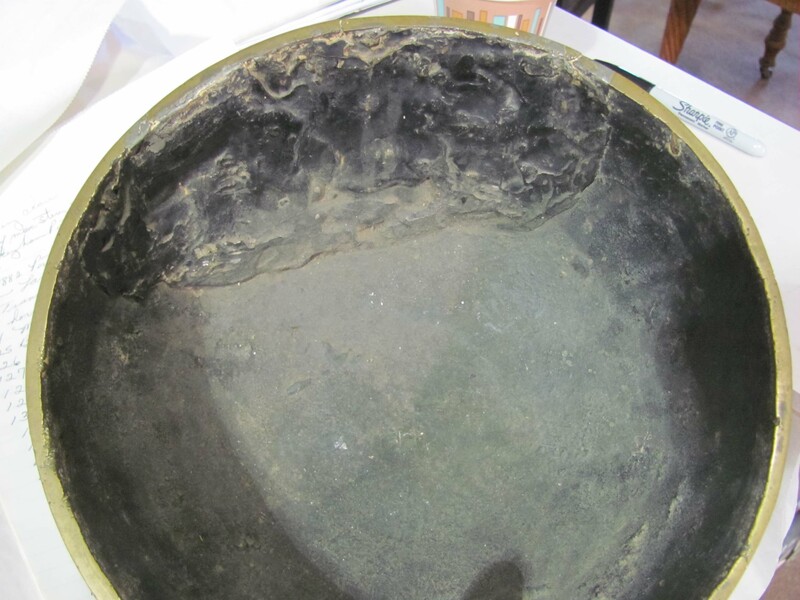 ACCESSORIES: Interesting 18th and 19th c. household woodenware, tinware, ironware, cooking and other fireplace items. 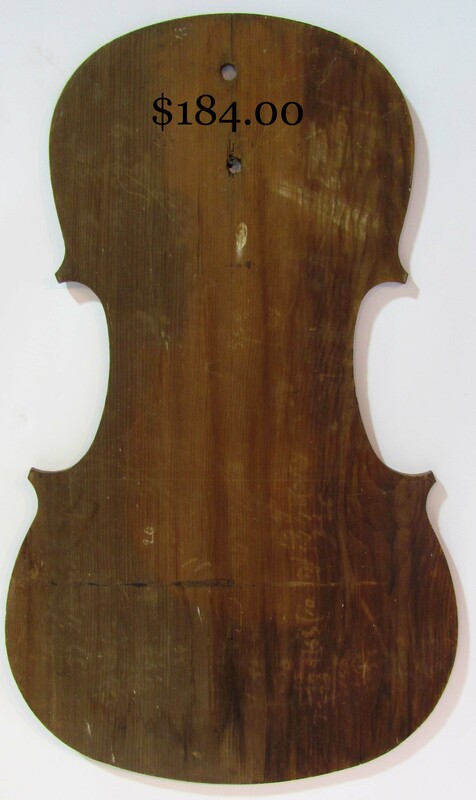 Early cello maker's template. Stately pair of brass lemon top andirons. 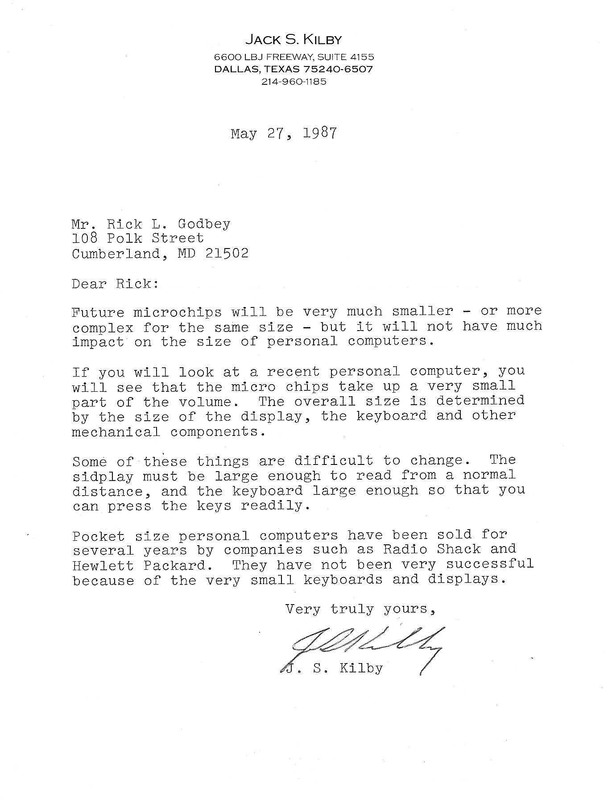 Early cooper’s tools. Color woven ME Indian and other baskets. 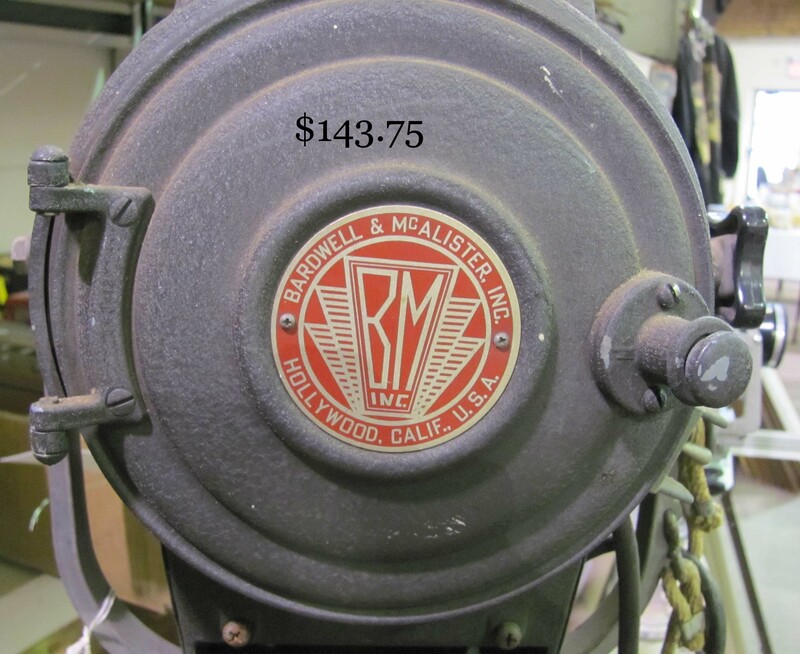 Rare Starrett iron duck presss. Hingham buckets. 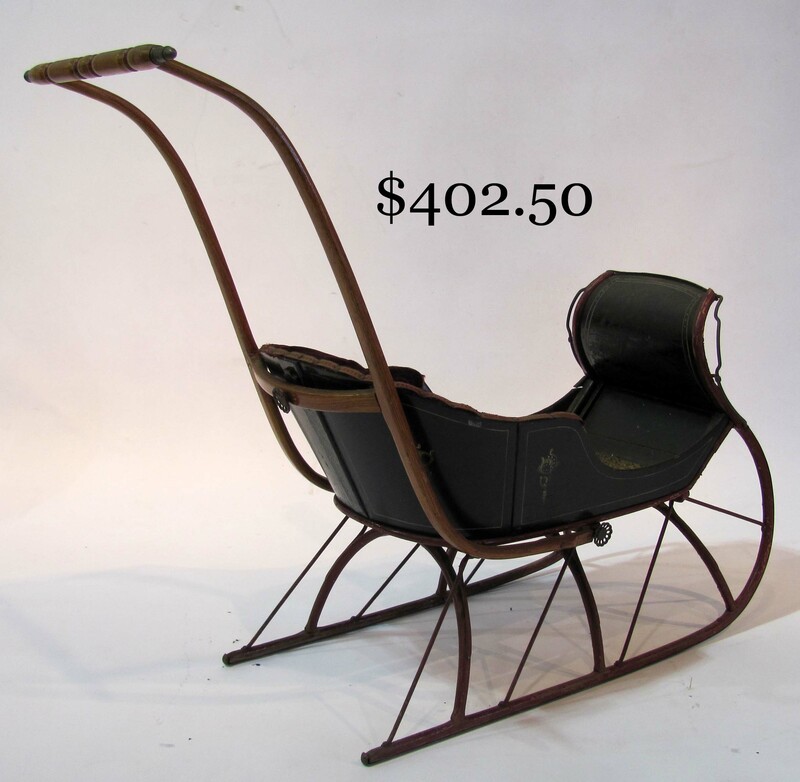 Decorated 19th c. child's push sleigh. Tubbs snowshoes. Decorative pair flame-top and lion mask andirons. Fancy walking sticks. Old Jerez (Spain) sherry cask. 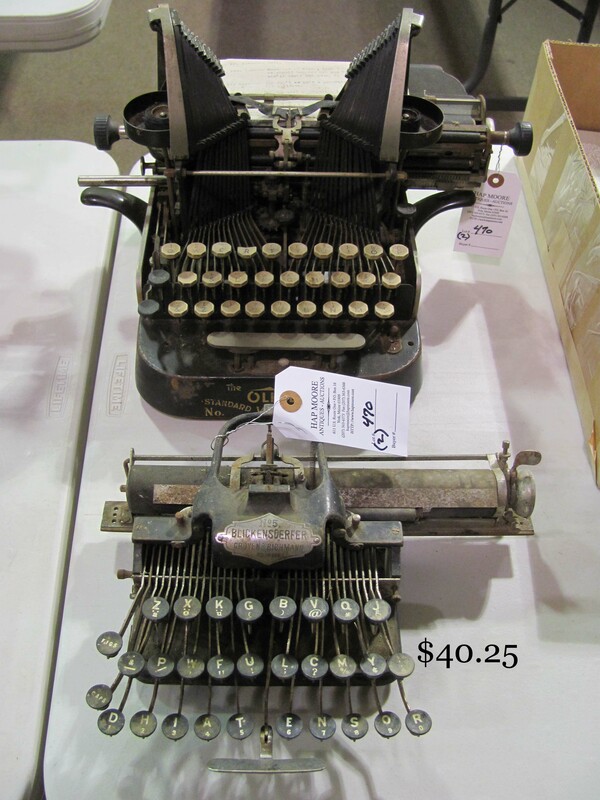 Early patent sewing machines and typewriters (1, 2). Edison cylinder players. Chantauqua Roller Organ and rolls. C. G. Conn cornet. Alto clarinet. Interesting desk accessories. 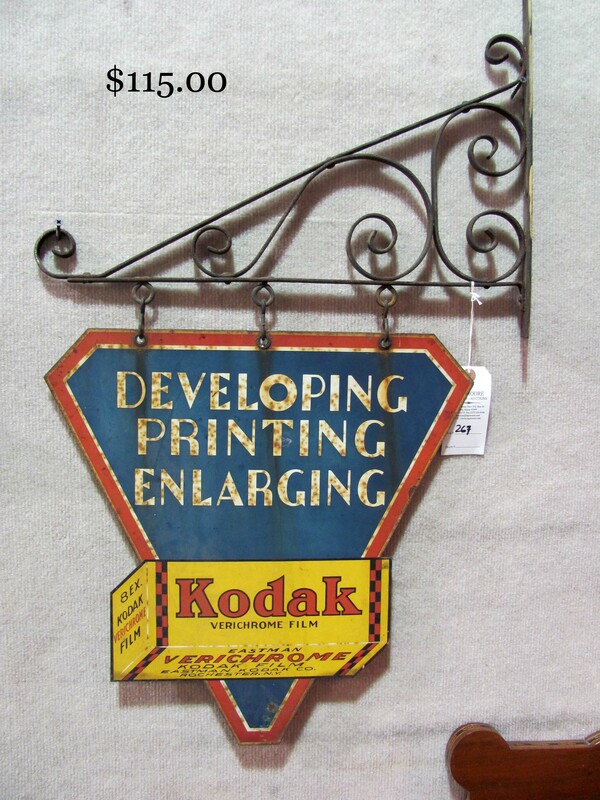 Advertising tins and novelties. 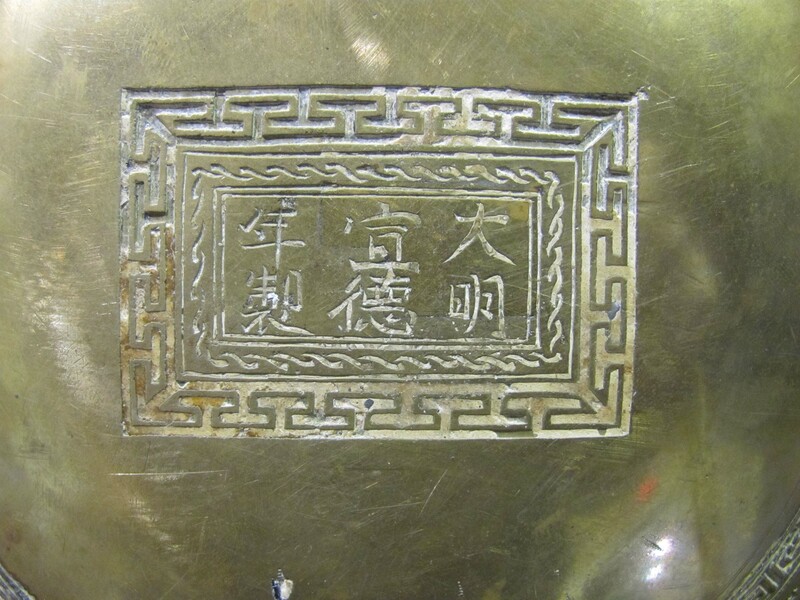 Large collection of brass bells. 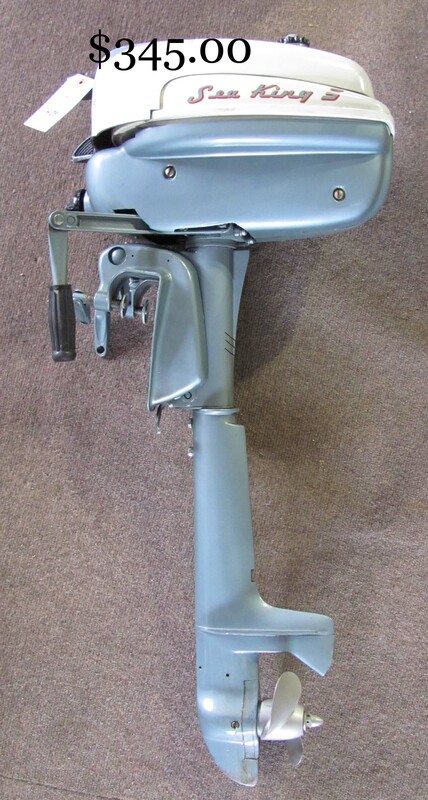 Unused 1953 Sea King 3 outboard motor in original box. 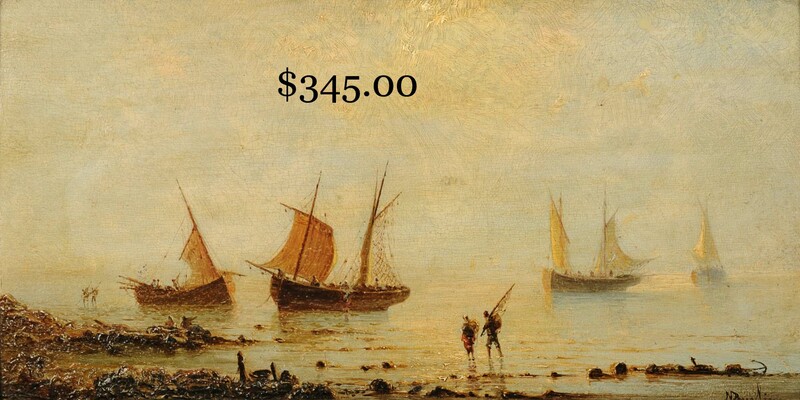 OLD PAINTINGS, PRINTS AND SCULPTURE: Eighteen fine oils and watercolors by Reuben Winslow (1862-1951), who painted in New England, the Islands and on the Continent, the works descending in his family to the present. 8 X 16 in. 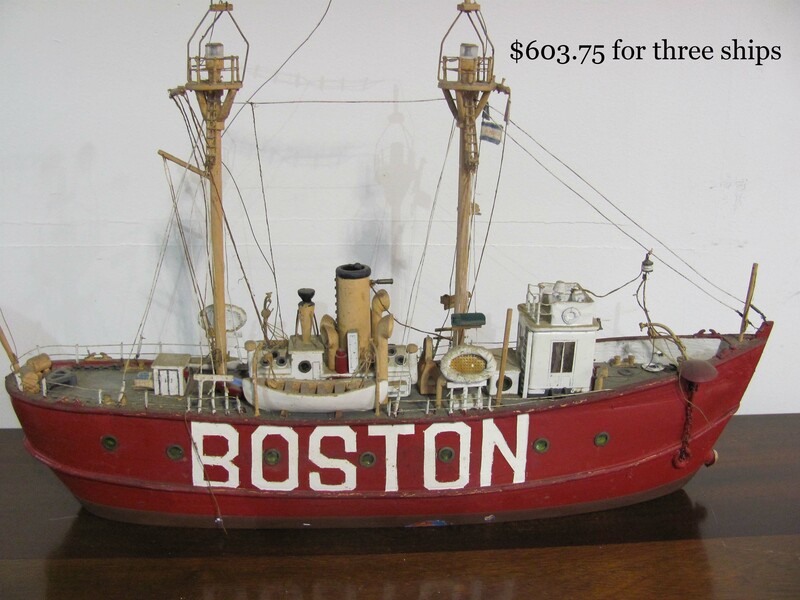 Natalie Curtis Burlin o/p of Continental fishing boats ashore. 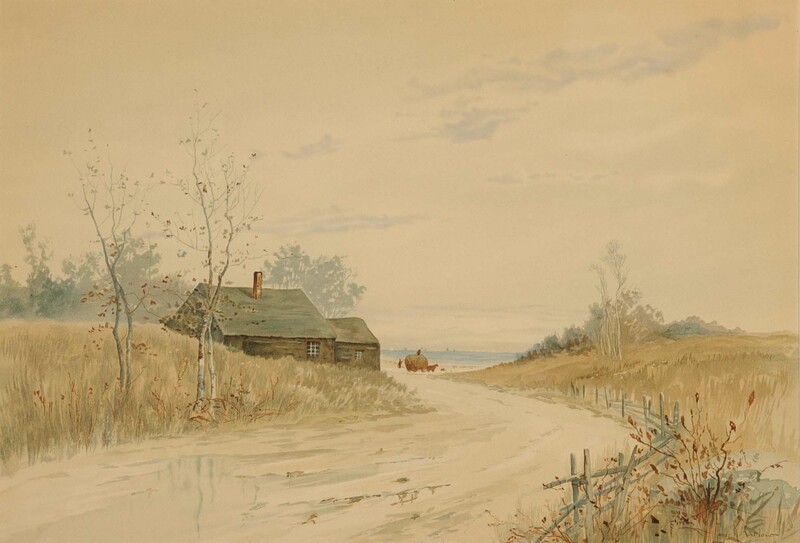 Louis K. Harlow shoreline cottage watercolors. W. Preston 24 X 30 in. oil of breakers. 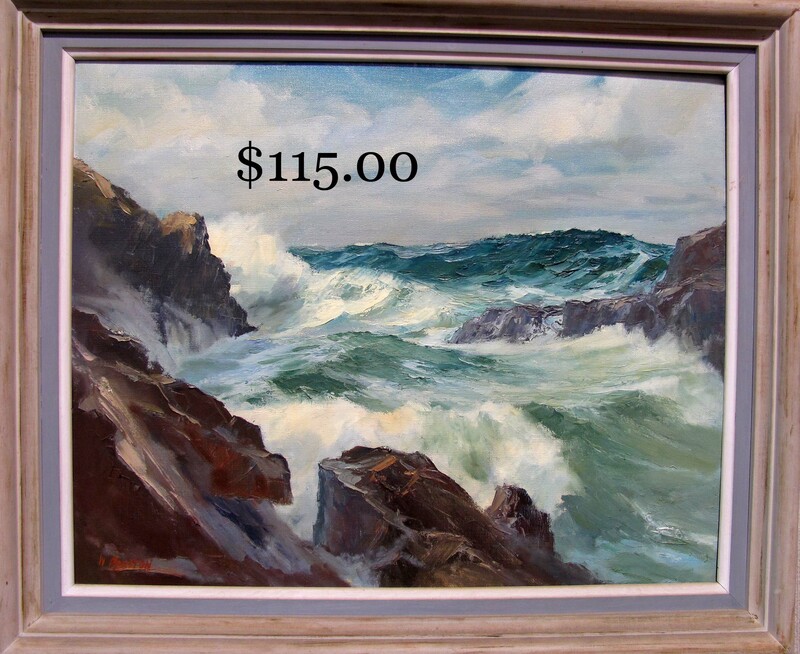 Ruth Munson oil of Perkins Cove (ME) breakers. 29 X 18 in. 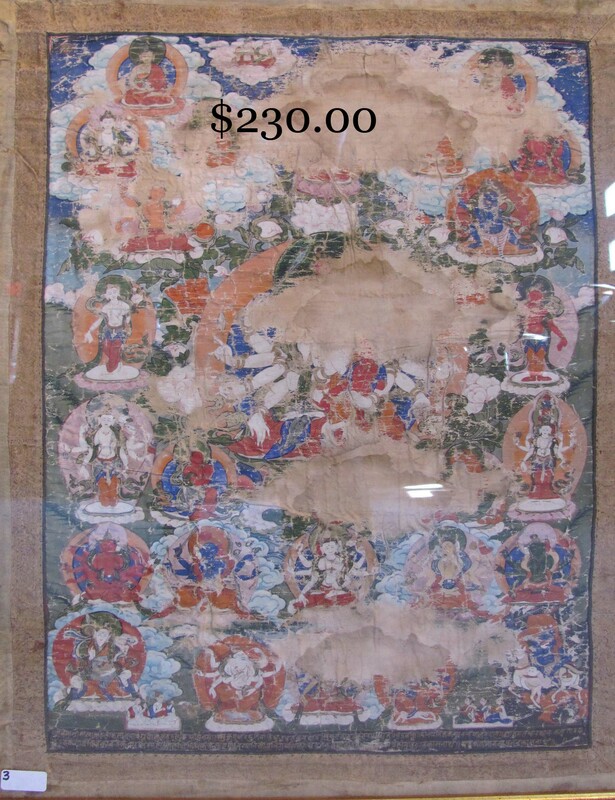 early Asian watercolor on silk of multiple Bodhisattvas. 18 x 25 in. 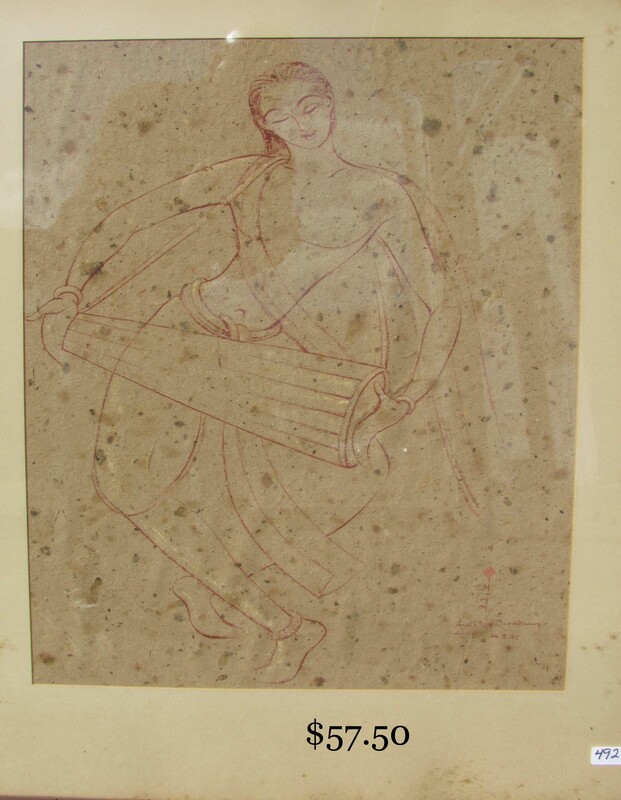 Avril Roy Shoudbury 1955 (signed) conte drawing. 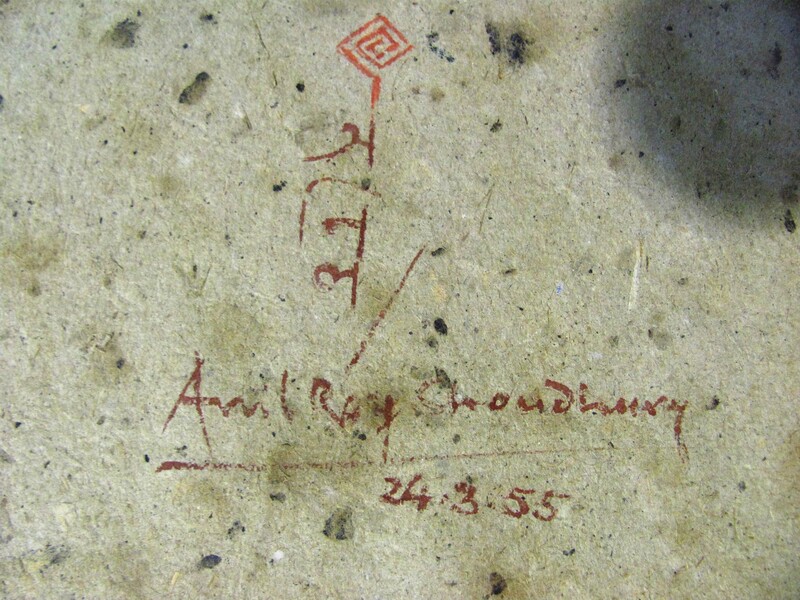 Indistinctly signed 6 x 9 in. 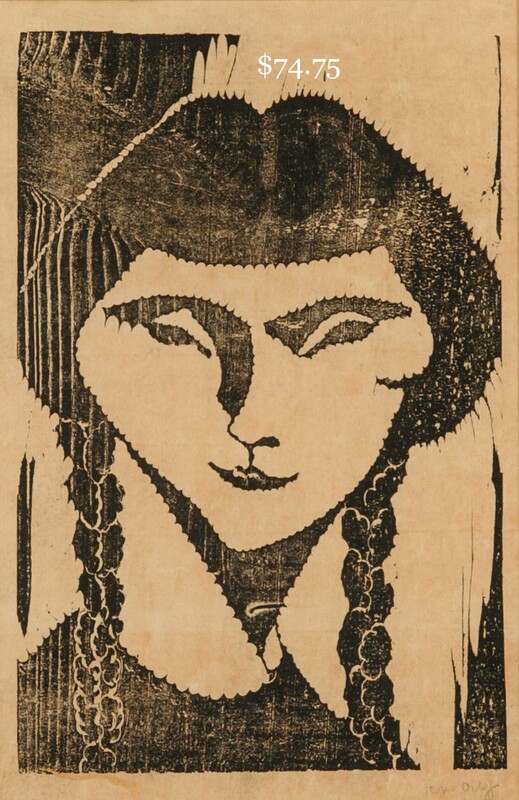 woodblock print of Indian girl. 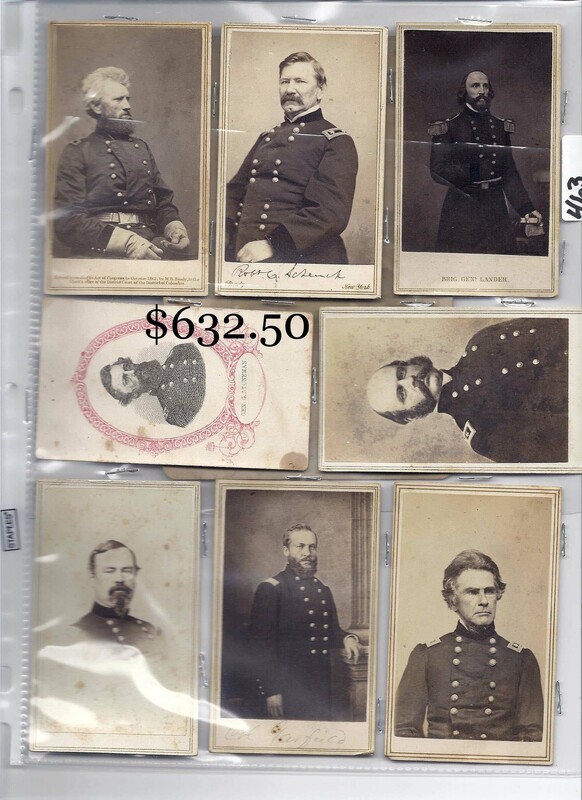 Six C. M. Russell western prints. Chas. 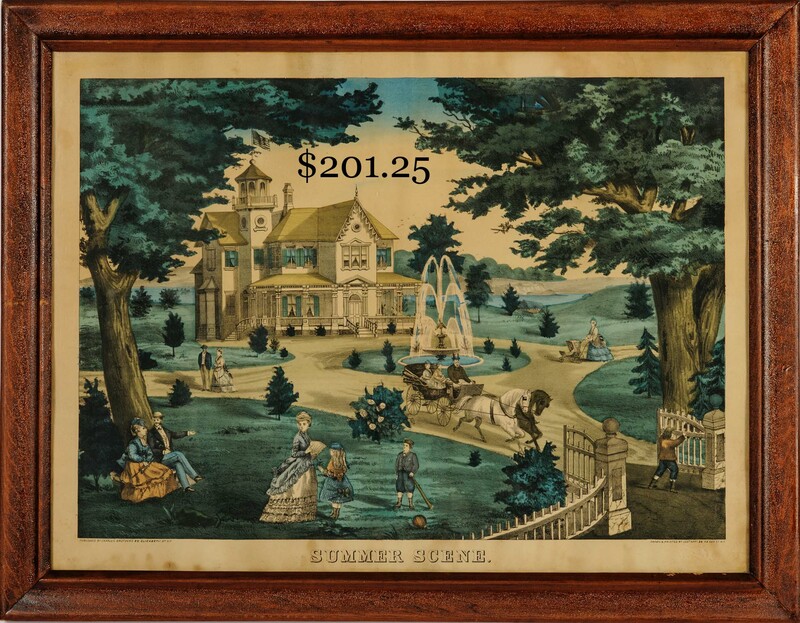 Hart Summer Scene lithograph. 13 ½ in. Leo Cherne 1955 bronzed plaster head of A. Schweitzer and unmarked bronzed plaster sculpture of a Town Crier. Other decorative works of art.